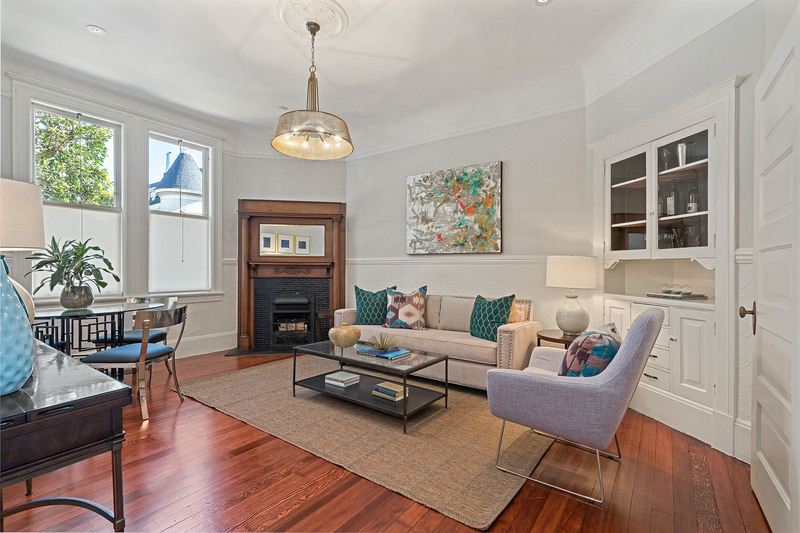 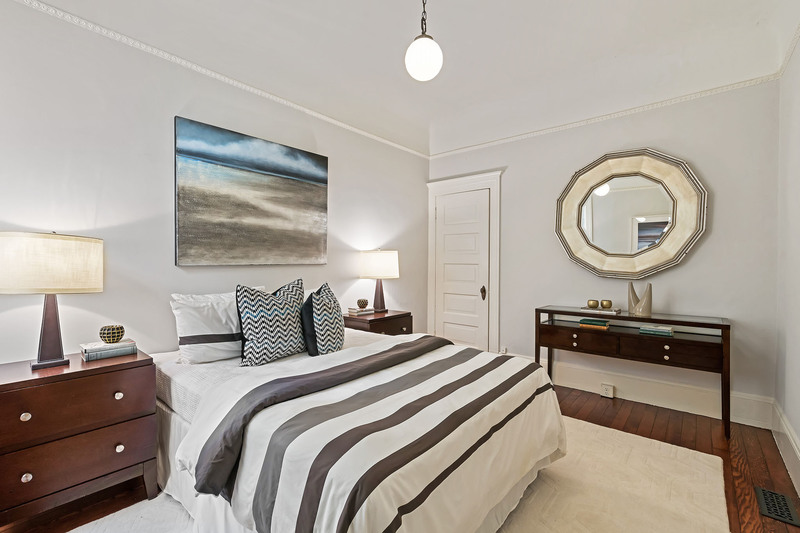 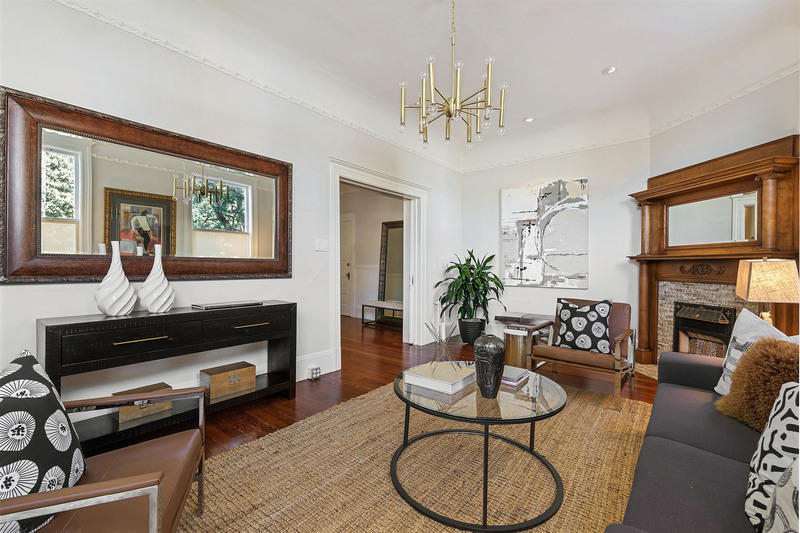 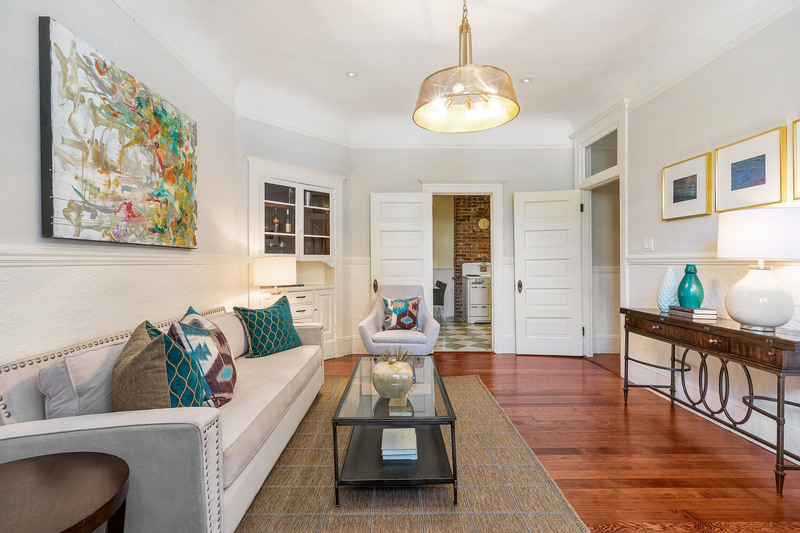 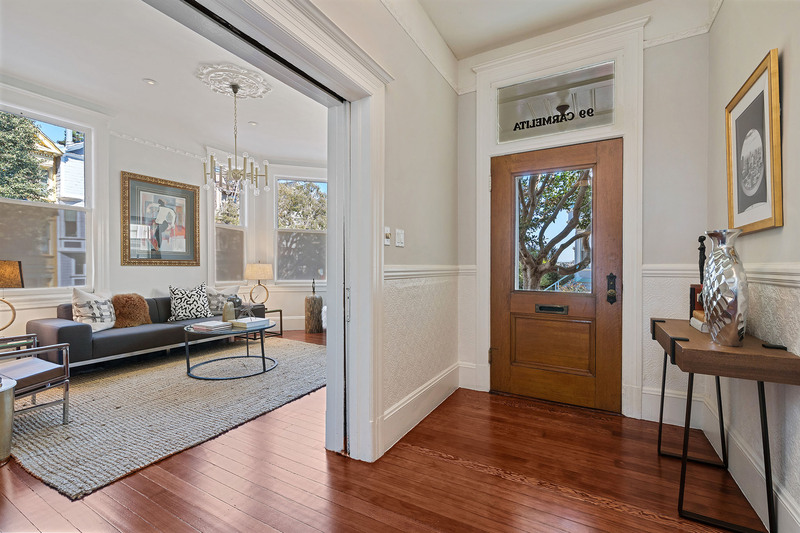 On a peaceful, tree-lined cul-de-sac at Duboce Park sits this beautiful, spacious and stately three-bedroom home. 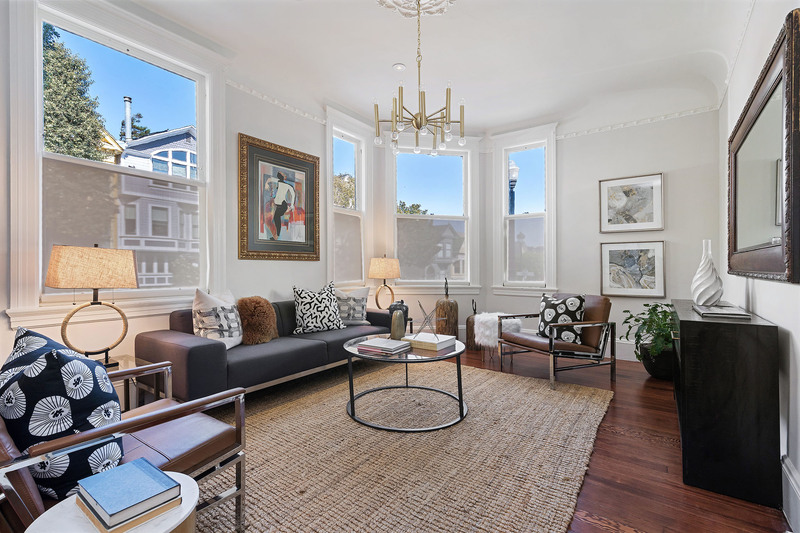 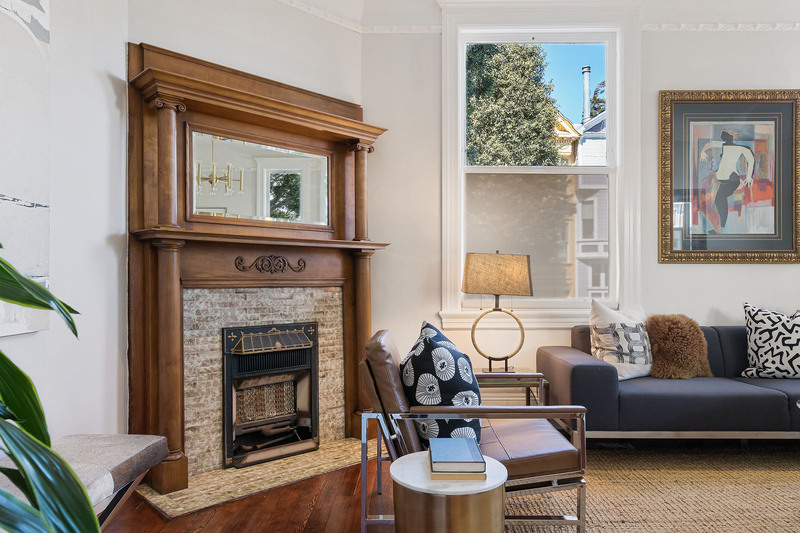 A rare and historic pre-quake Classical Revival Edwardian gem with a gracious floor plan, 99 Carmelita is situated in an unbeatable location at the hub of some of San Francisco’s most vibrant neighborhoods. 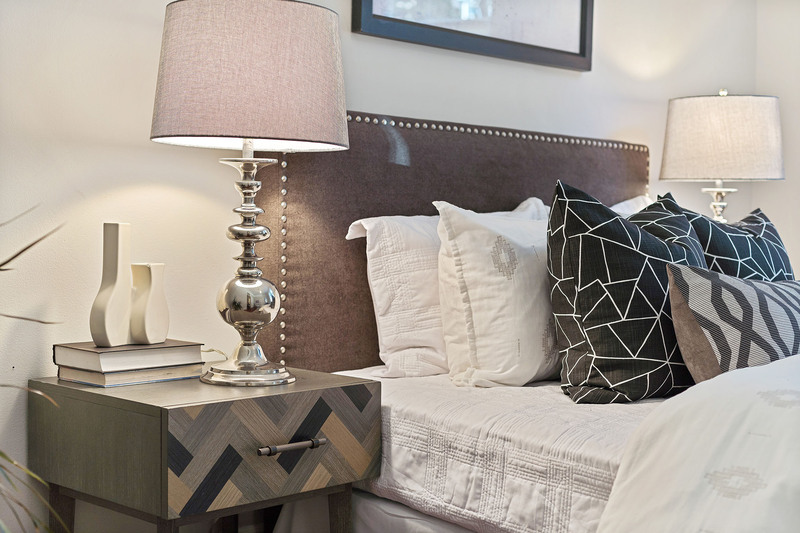 Steps from top-notch transportation, restaurants, cafes, shops, entertainment, parks, playgrounds and more, yet nestled within the prestigious Duboce Triangle Landmark District. 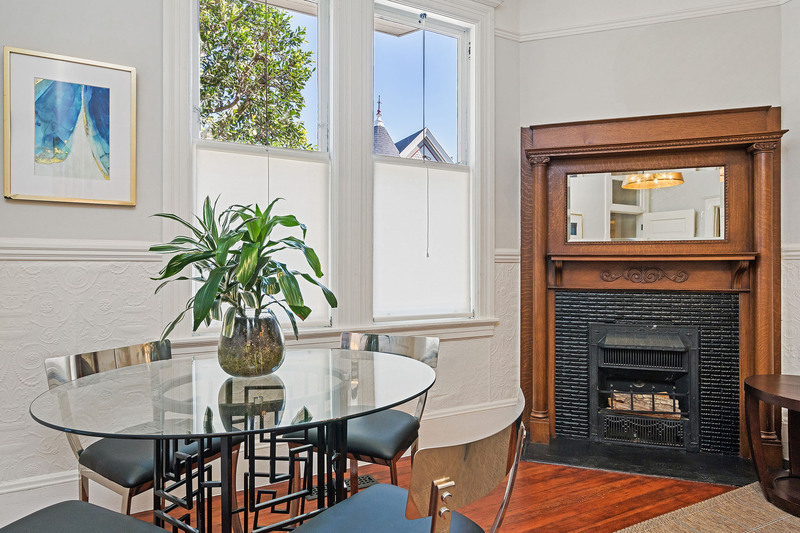 It’s now on the market for the first time in 23 years. 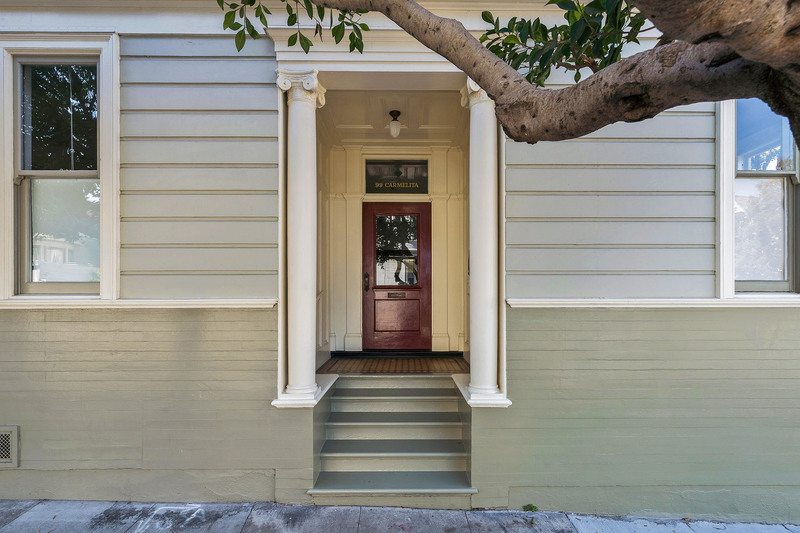 99 Carmelita has its own private entrance, with patterned tile flooring flanked by two lovely columns. 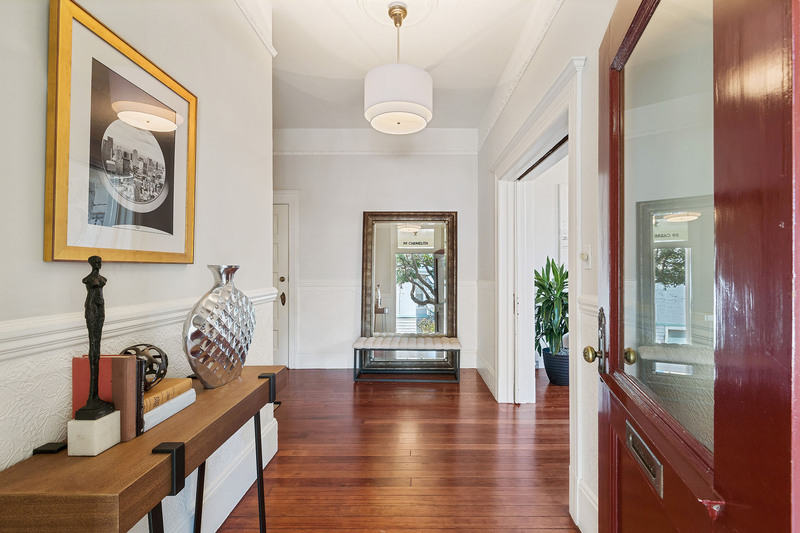 Through a dramatic deep red door, you enter an impressive foyer with high ceilings and luxurious wood flooring contrasting with fresh white walls. 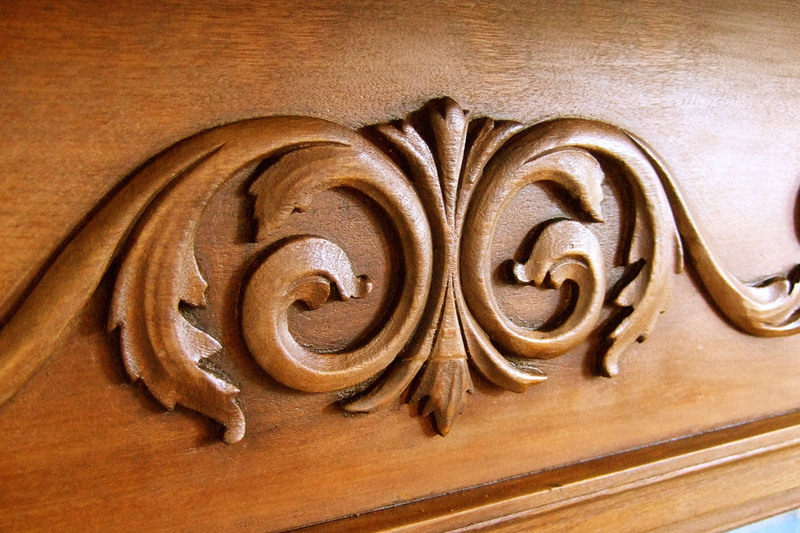 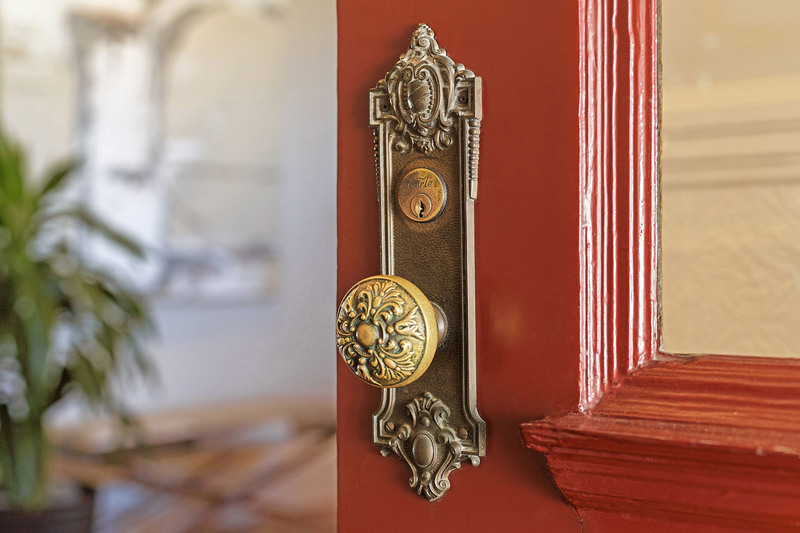 Charming period details abound throughout, including plaster rosettes, patterned wainscoting, carved crown moldings and picture rails, coved ceilings, and five-paneled doors with intricately detailed doorknobs and hinges. 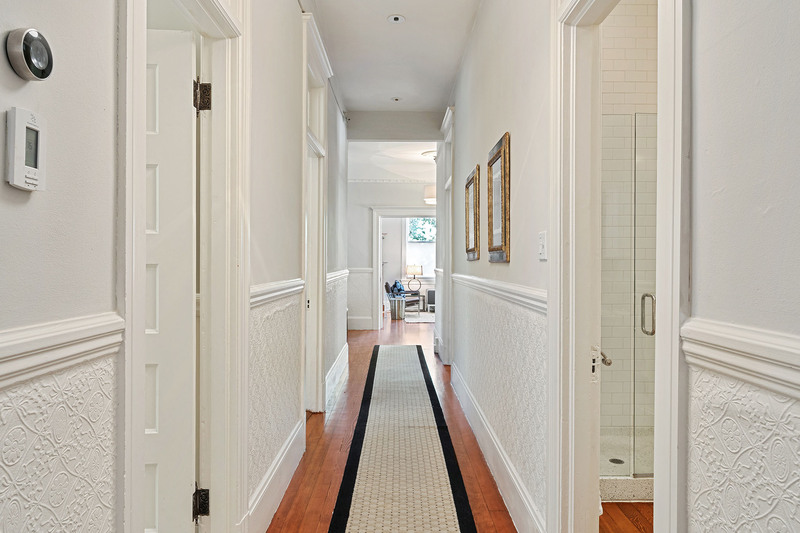 To the right of the foyer is a formal living room, separated by an archway with concealed pocket doors. 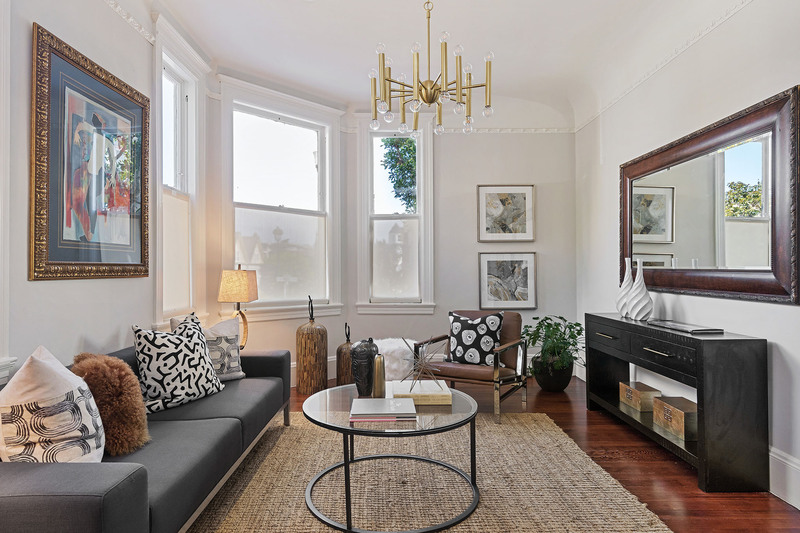 The living room is on a corner, with oversized windows facing east and north allowing leaf-dappled sunlight to stream through. 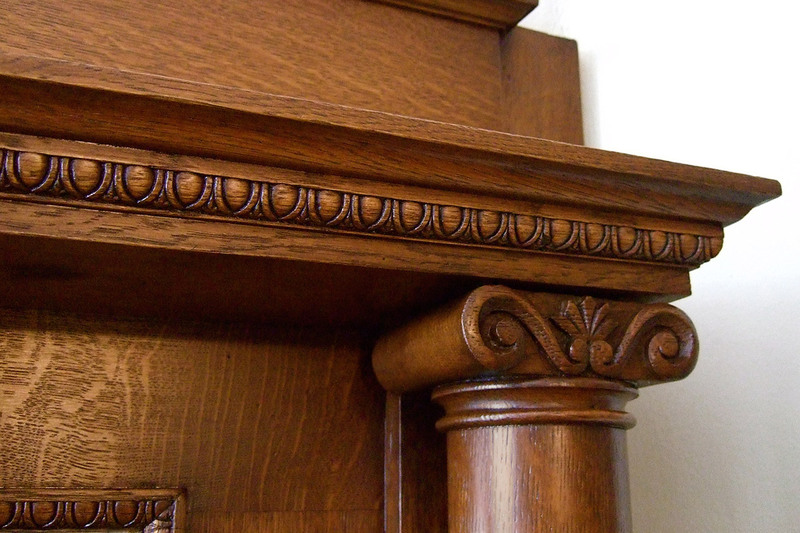 A delightful decorative fireplace with impeccably restored carved wood mantle makes a welcoming centerpiece for the room. 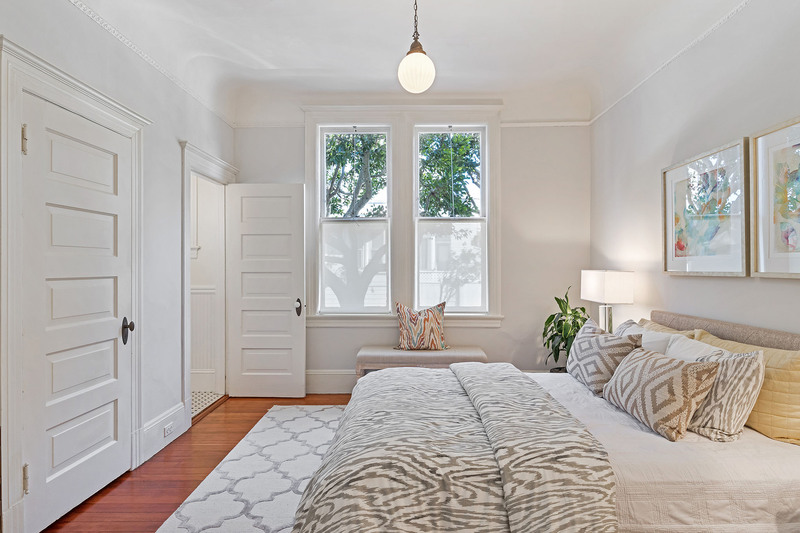 To the left of the foyer, past a coat-and-linen closet, is the first of three bedrooms in the quiet center of the home: a large bedroom with double-pane windows framing the old-growth trees on Carmelita. 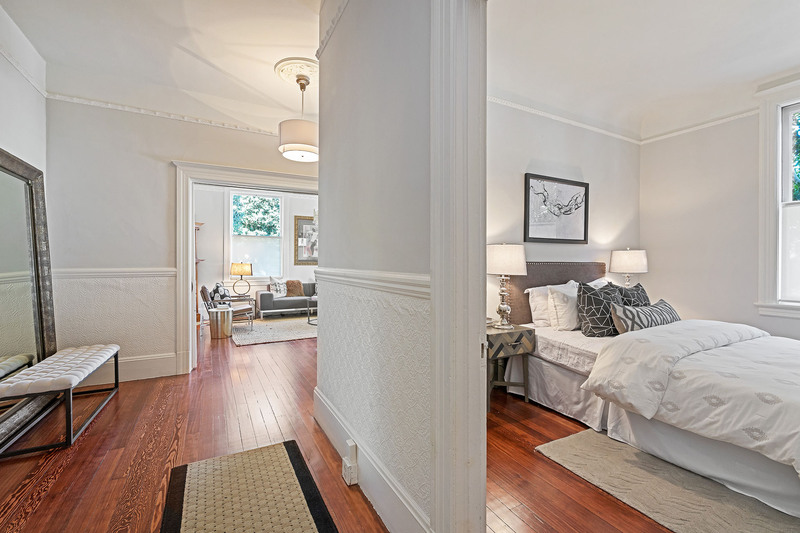 Across the hall is a second bedroom, with a large walk-in closet. 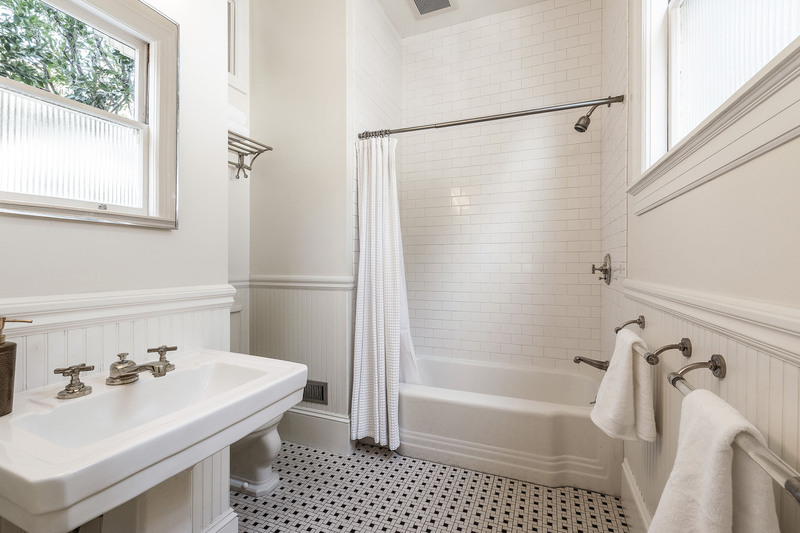 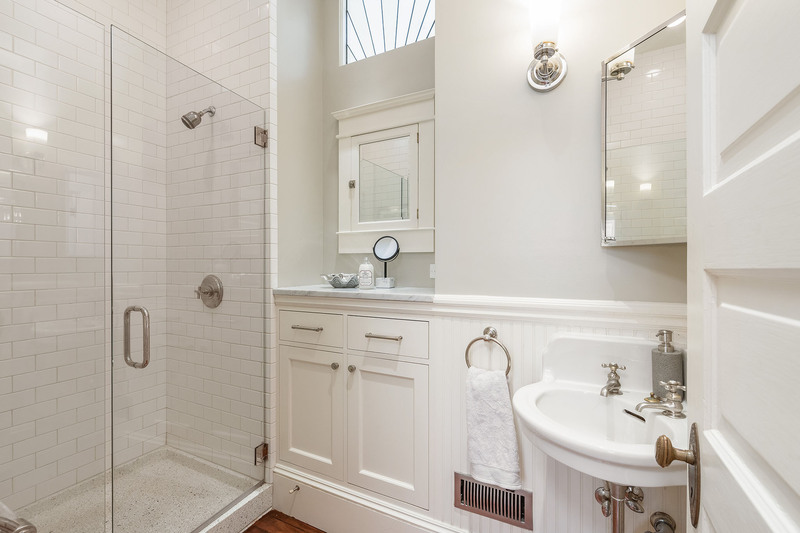 Serving both these bedrooms is a split bathroom; on one side is a glass-enclosed shower with floor-to-ceiling subway tile, Carrara stone countertop, antique corner sink and built-in cabinets. 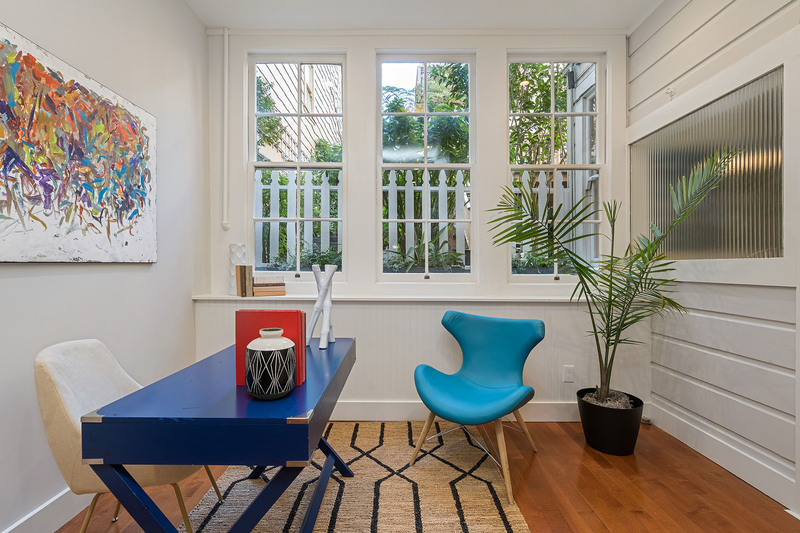 A stained-glass window overhead allows natural light in. 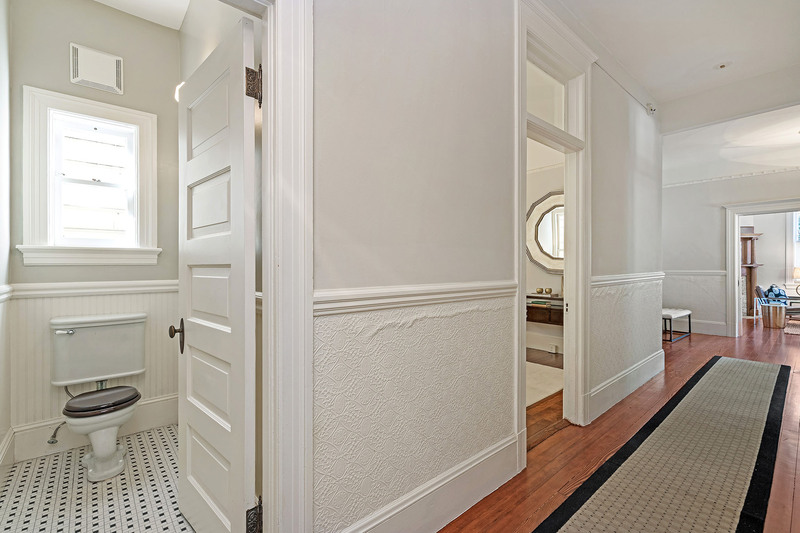 The adjacent water closet has radiant heating, a black-and-white tile floor and vertical wainscoting. 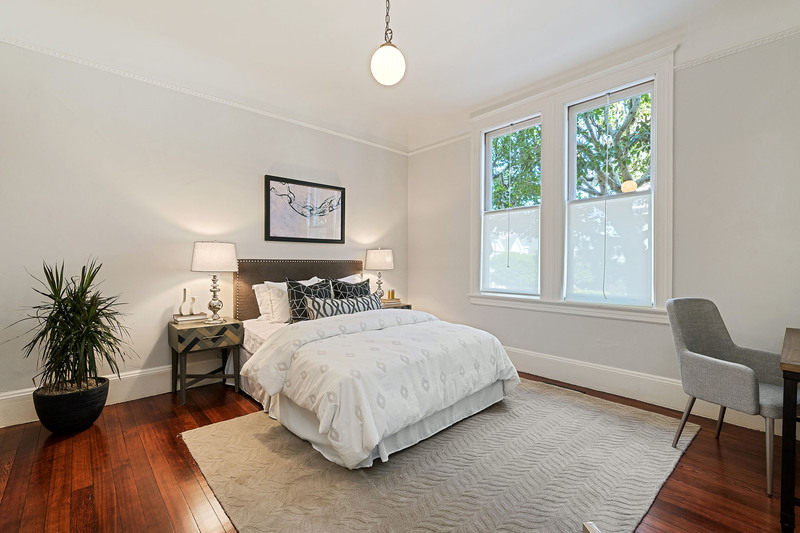 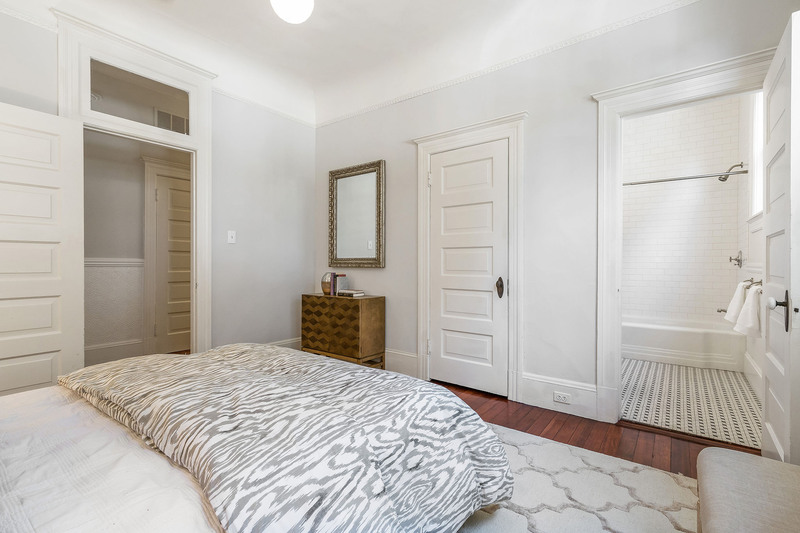 The master bedroom at the end of the hallway is especially private, and offers east-facing windows with leafy tree views and an ensuite master bathroom with radiant-heated black-and-white tile flooring and shower over vintage tub. 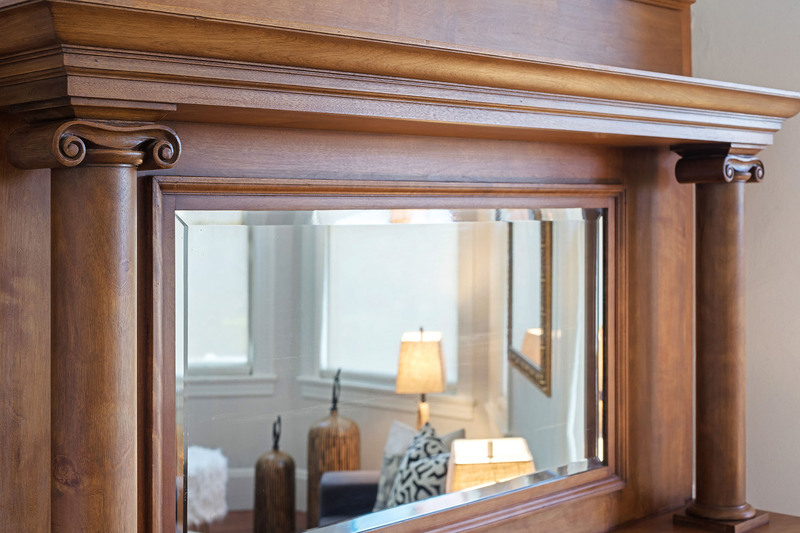 The large formal dining room is the definition of grand, outfitted with original windowed cabinetry and built-ins, recessed lighting, and an elegant ornamental fireplace with carved oak mantle. 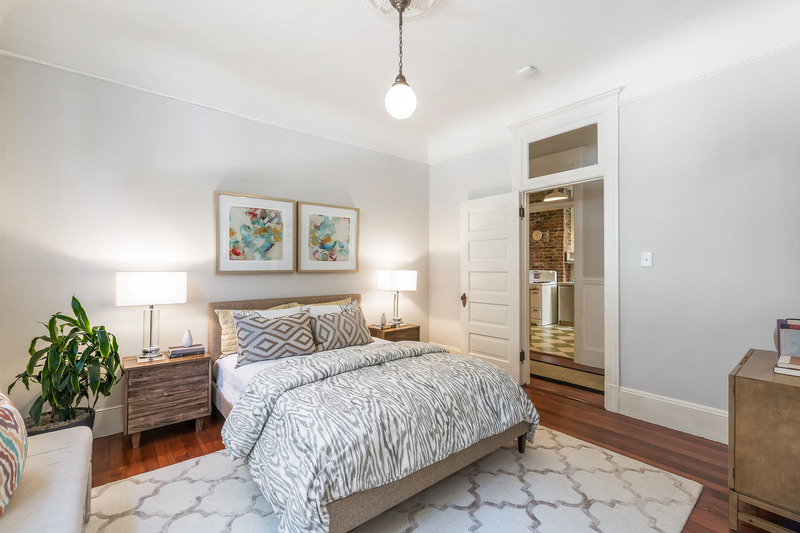 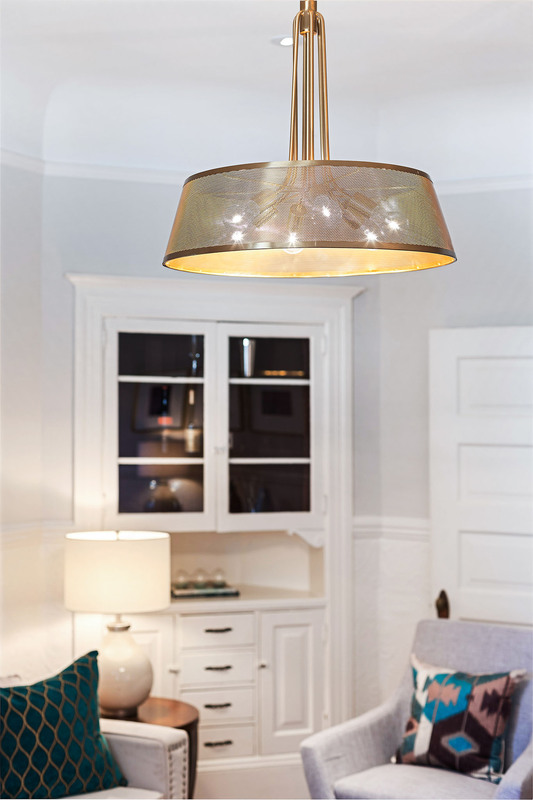 The wainscoting in this room is whimsical, and a beautiful ceiling medallion encircles the pendant light overhead. 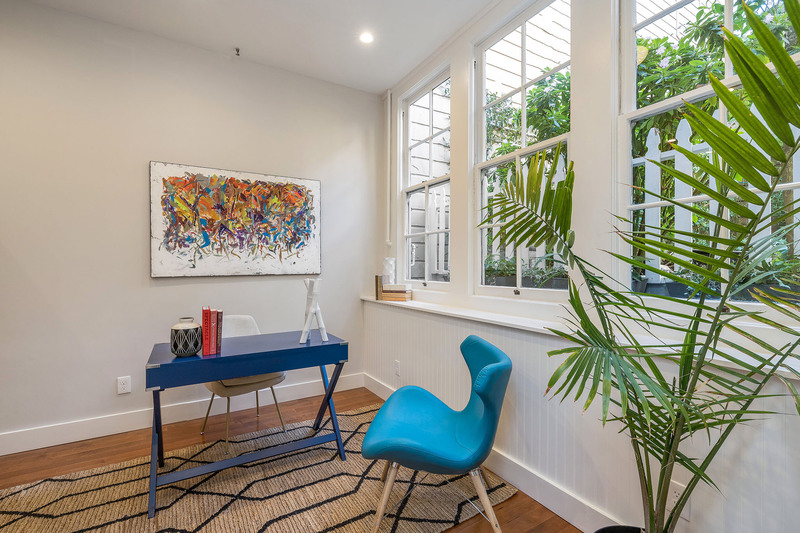 With room for both dining and seating, this bright space is perfect for flexible family gatherings and ideal for large dinner parties and events. 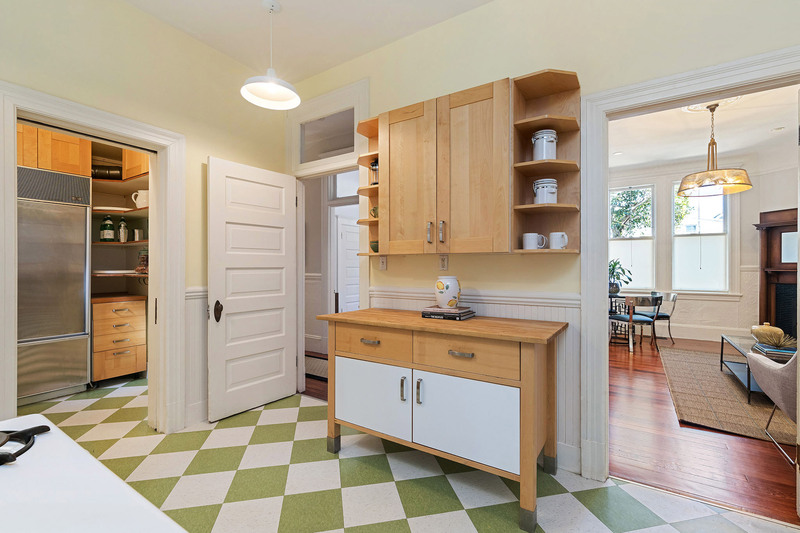 The kitchen displays a cheery green-and-white tile patterned floor, light wood Shaker cabinetry, a butcher block counter and Carrera marble countertop. 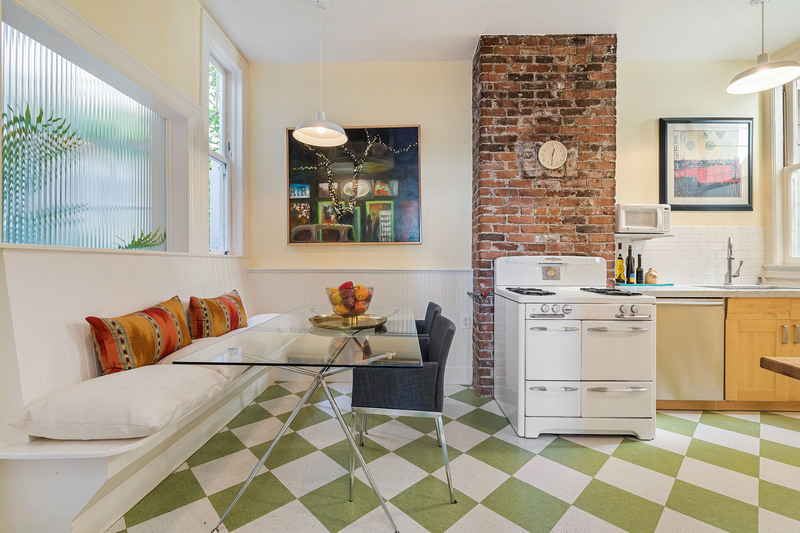 An incredible vintage O’Keefe & Merritt freestanding range is backed by a column of exposed brick, lending an air of charm and industrial chic to the space. 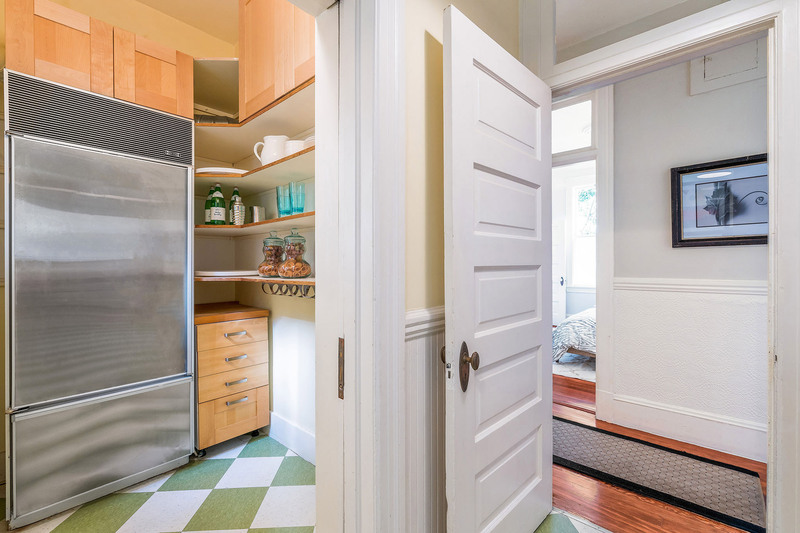 Appliances include a stainless Bosch dishwasher, two-bowl stainless sink, and Sub-Zero refrigerator in the walk-in butler’s pantry. 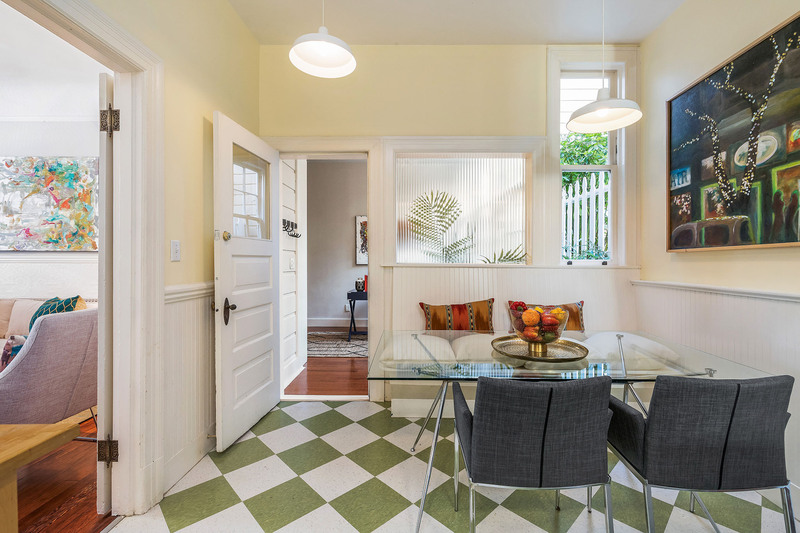 At one end of the kitchen, delineated by a built-in bench and surrounding wainscoting, is a breakfast nook – light and bright, this is an ideal spot for informal dining. 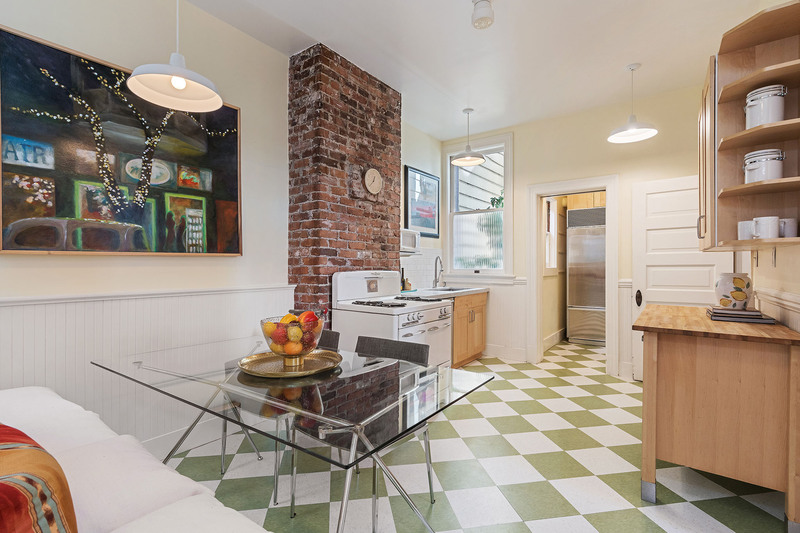 Off the kitchen is a fantastic family room, with a wall of windows looking out to flower boxes and a neighboring garden. 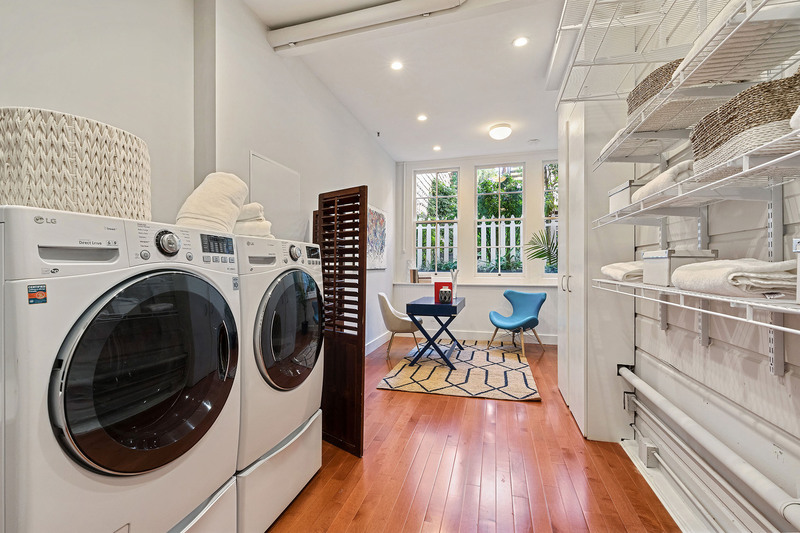 This bonus room is equipped with brand new hardwood flooring and a side-by-side LG washer and dryer, as well as a closet and shelving for storage. 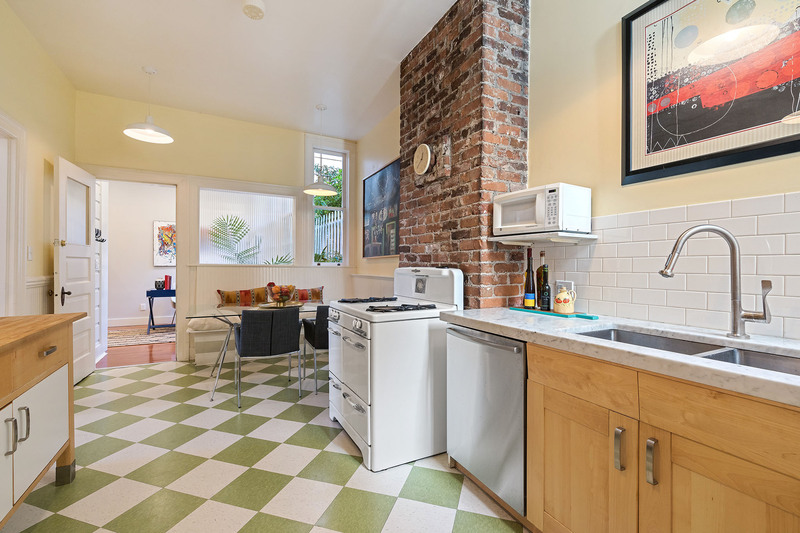 Bicycling commuters can store their wheels here, roll out of the room’s separate street exit, and pedal right onto the city’s best bike route (“The Wiggle”). 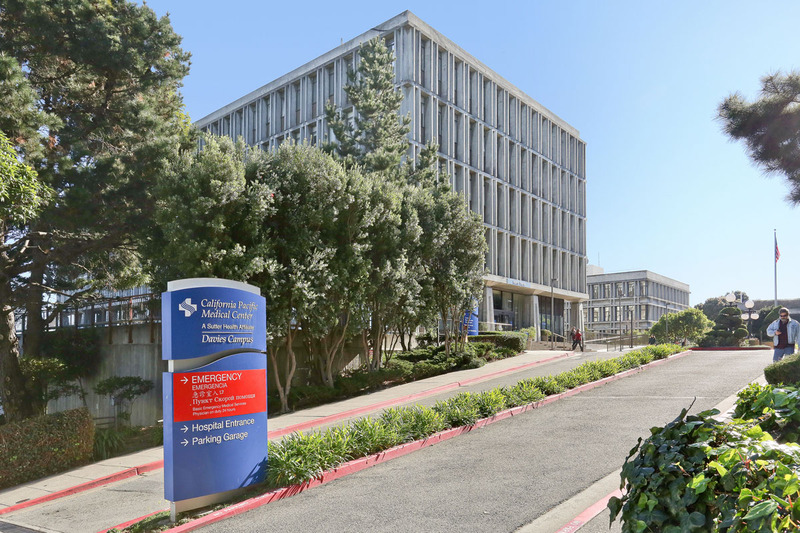 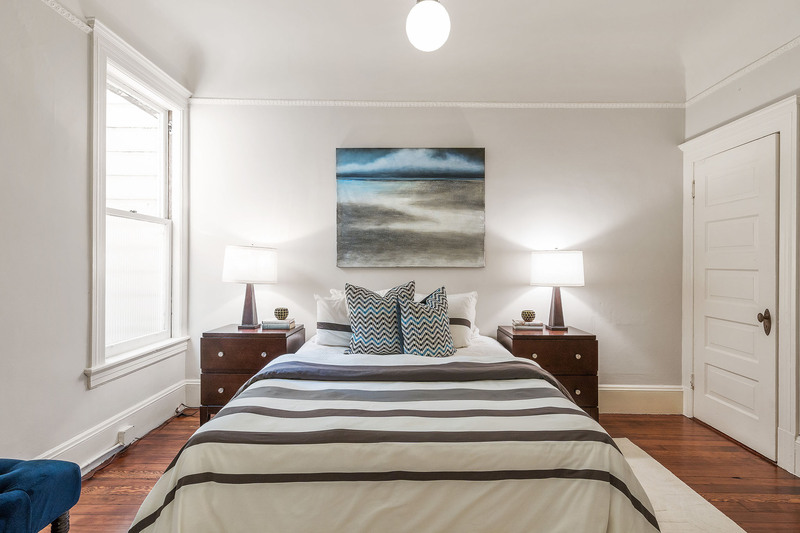 Seamlessly integrated modern touches include a tankless on-demand water heater, Nest thermostat & smoke alarms, CAT5 Internet wiring, wireless high-speed Internet receiver and solar electric panels on the building’s brand new roof. 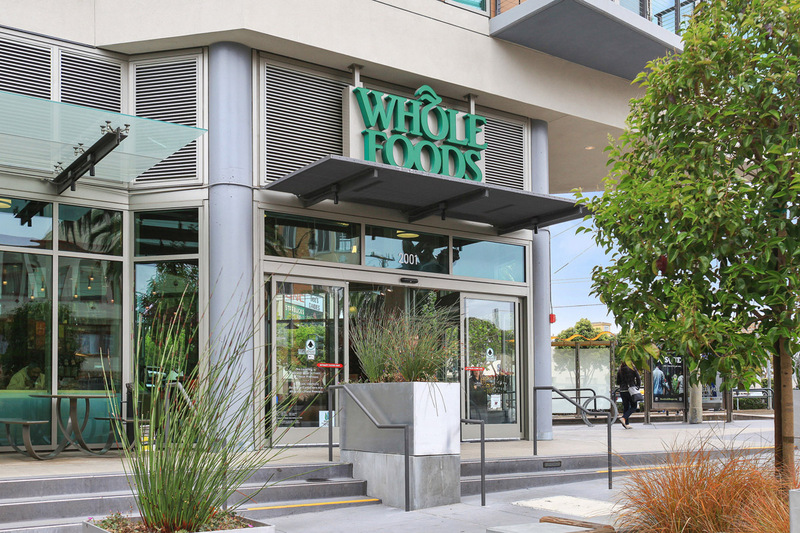 A leased parking space is right across the street. 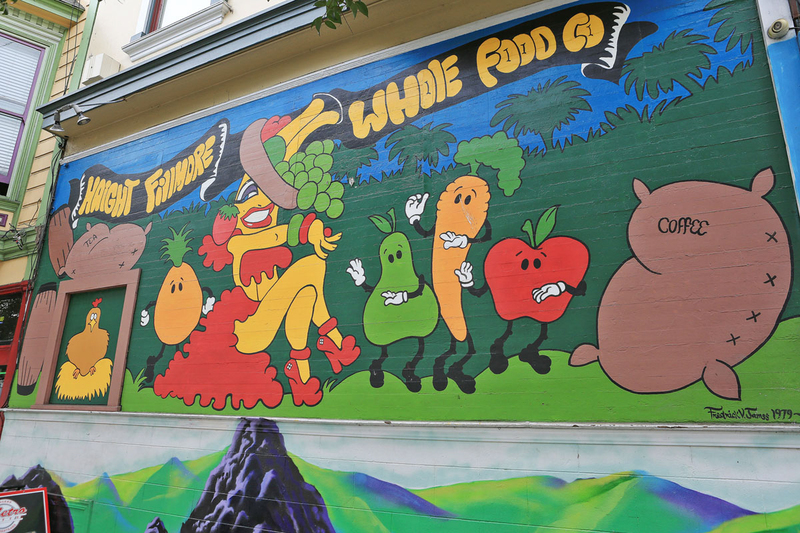 The location is as perfect as any in San Francisco – a true walker’s (and food lover’s) paradise. 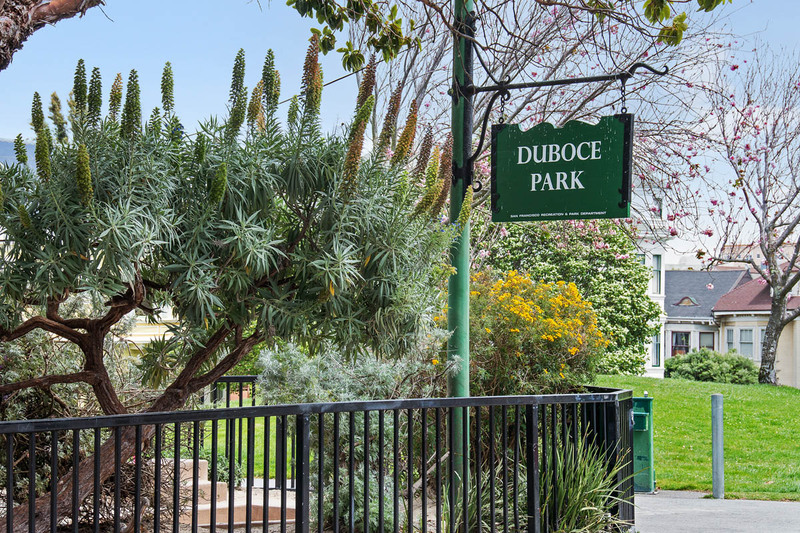 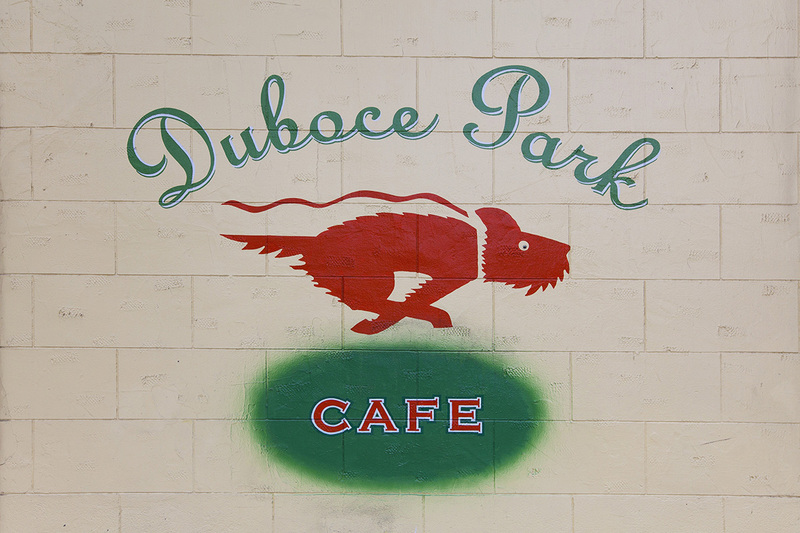 Duboce Park is just steps away, with its open grassy areas, wandering paths, playground, dog run, basketball court and community center. 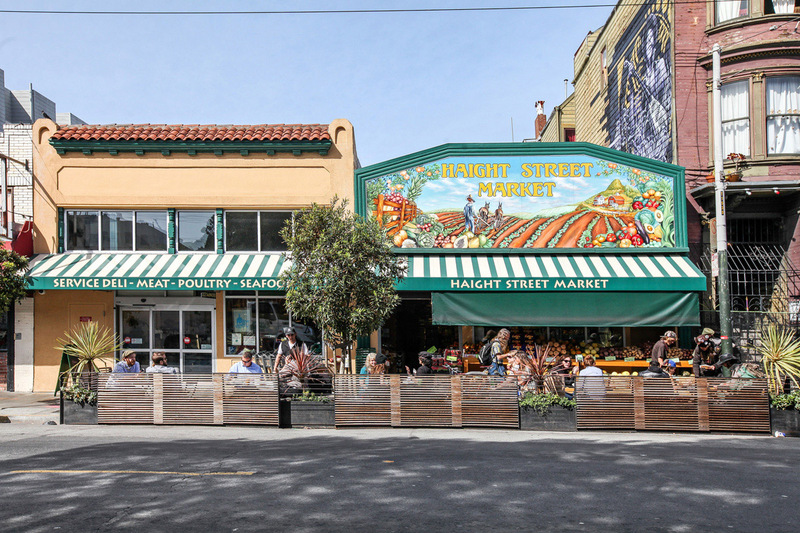 It’s also a short stroll to Bi-Rite, Whole Foods and Safeway, farmers markets, fruit stands, endless intriguing shops, award-winning restaurants (Nopa, Nopalito, Ragazza, Maven, Uva Enoteca, Nara Sushi, Little Chihuahua, Souvla etc. 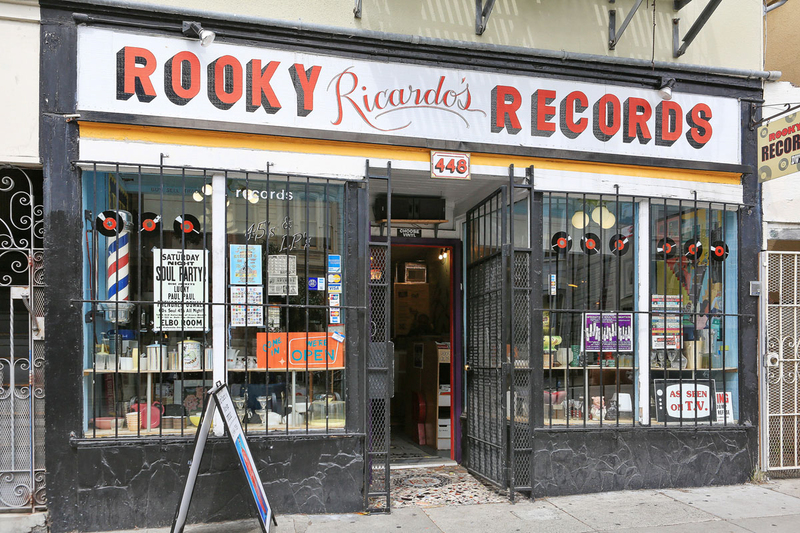 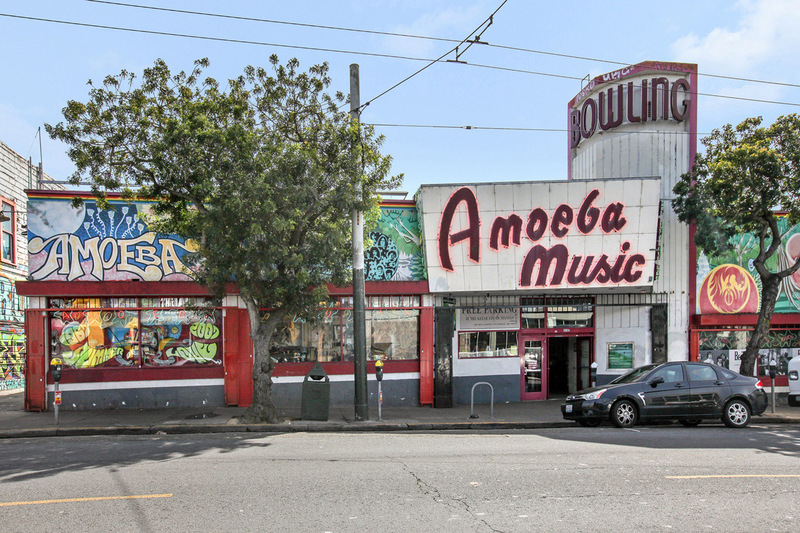 ), bistros (Cafe Révielle, Cafe Du Soleil, Duboce Park Cafe) and brewpubs (Black Sands, Magnolia) as well as first-rate entertainment (The Independent, Castro Theatre) and world-class public transportation (99 Transit Score). 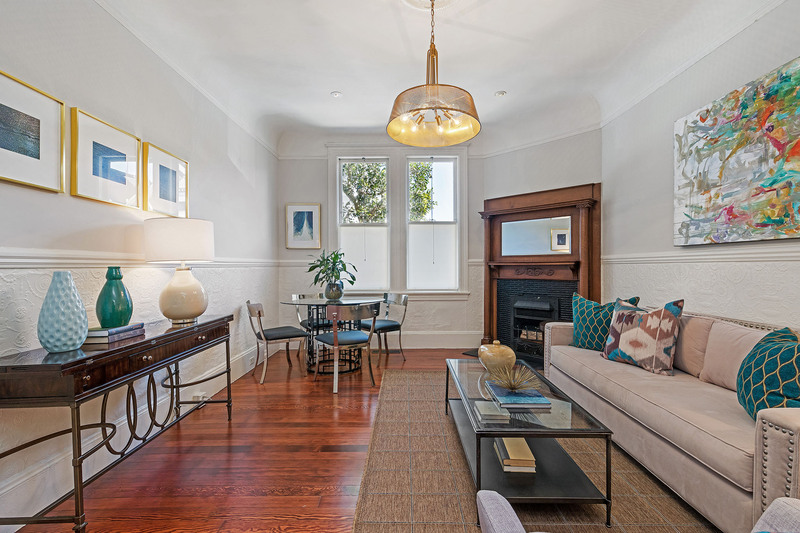 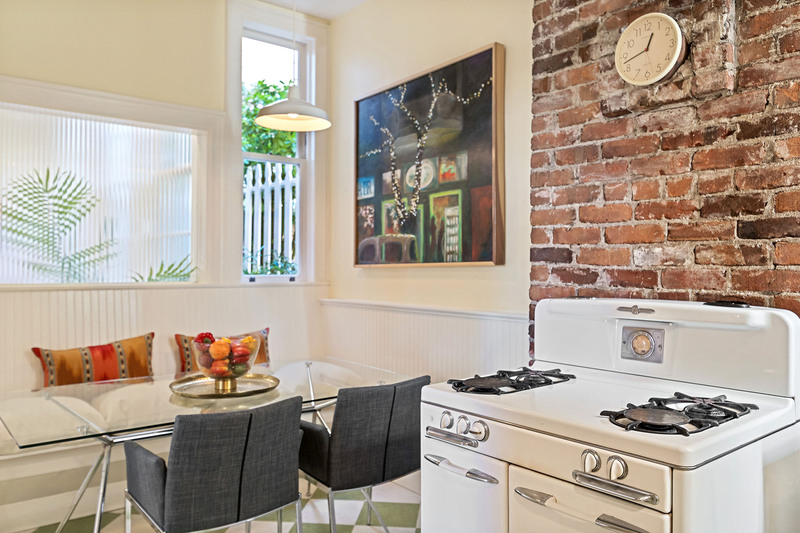 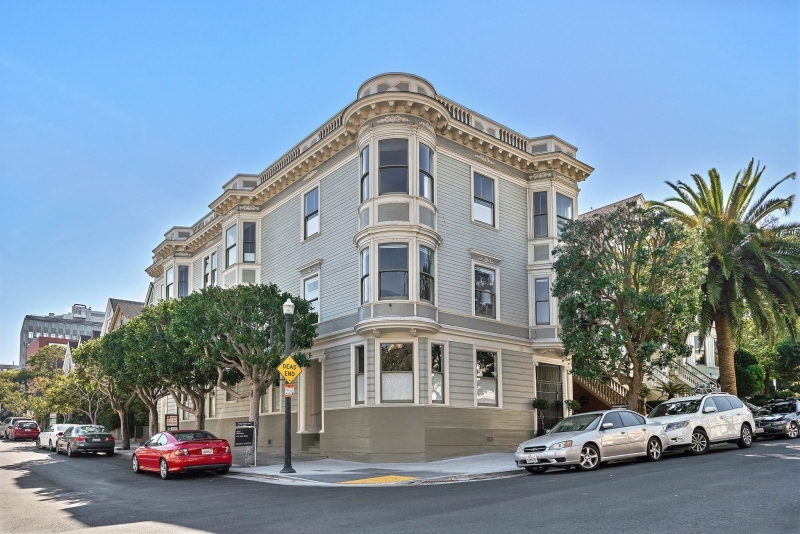 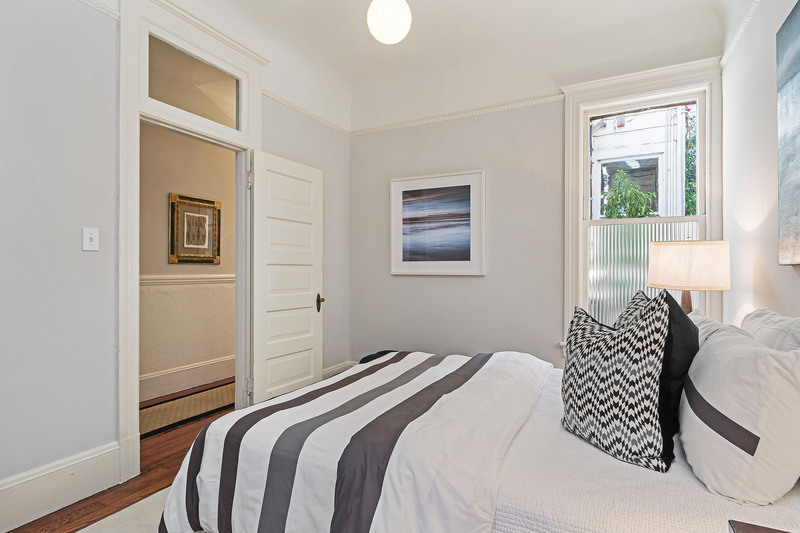 This spacious corner flat is full of character, charm and history, an inviting oasis at the geographic center of San Francisco in Duboce Triangle with the best of the Haight, Castro, and Divisadero Street right around the corner. 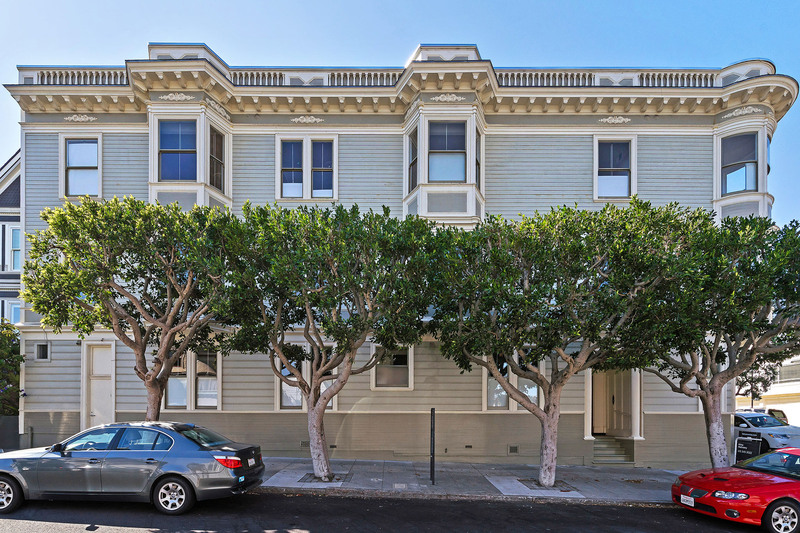 Surrounded by grand-scale historic buildings, 99 Carmelita enjoys a prime location within the Duboce Triangle Landmark District, at the nexus of four thriving neighborhoods. 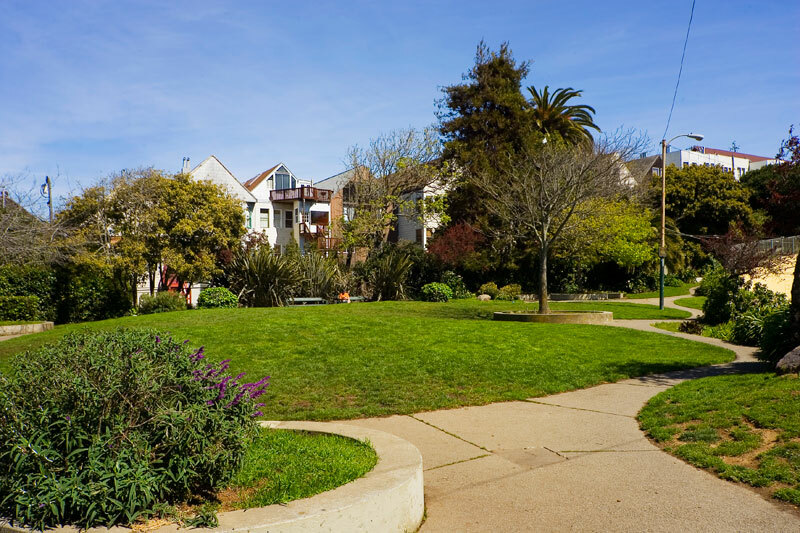 Most significantly, it is positioned at the entrance to a short and secluded tree-lined cul-de-sac that leads directly into Duboce Park, surely one of the most inviting public spaces in San Francisco. 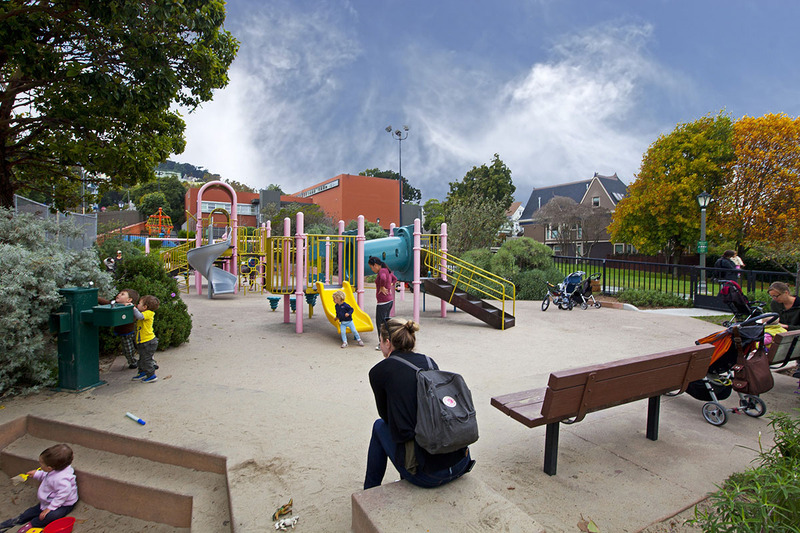 Whether you enjoy walking your dog, sunbathing, family time at the playground, basketball with friends, or taking in the latest photography exhibit (or yoga class) at the Harvey Milk Center, you'll love this superb urban park less than a minute’s walk from your front door. 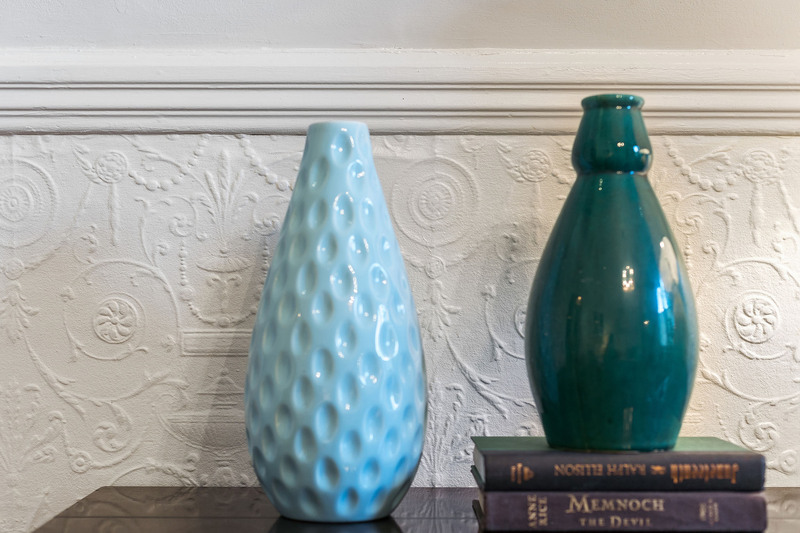 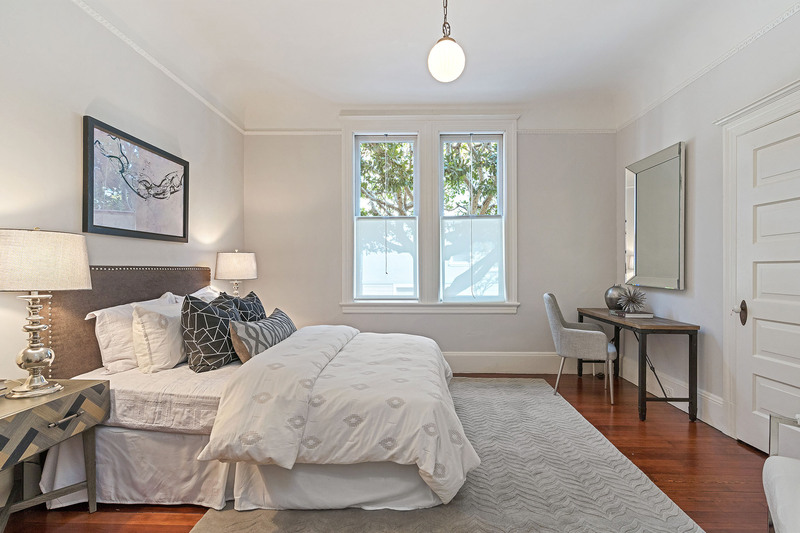 Duboce Triangle is an utterly charming residential enclave conveniently situated at the crossroads of four wonderful adjoining neighborhoods (Lower Haight, NOPA, Castro and Hayes Valley) and centrally located for access to the rest of the city. 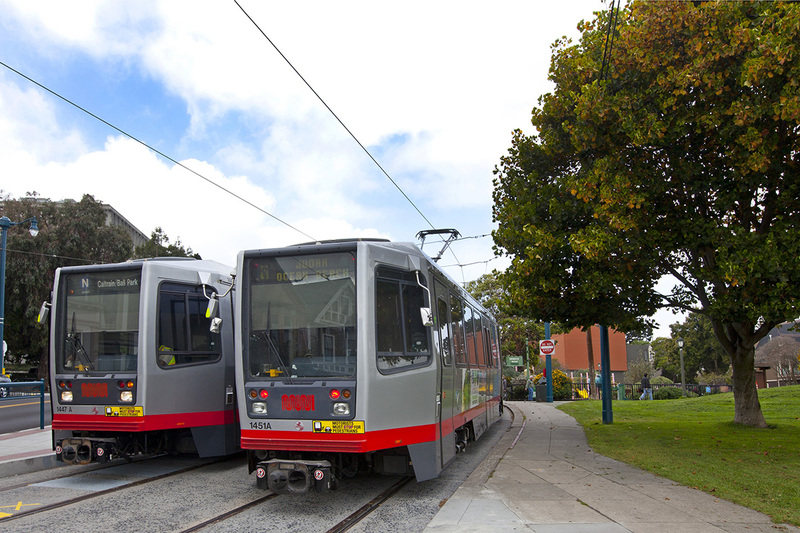 Downtown commuters can hop onto the N Judah streetcar right at the park. 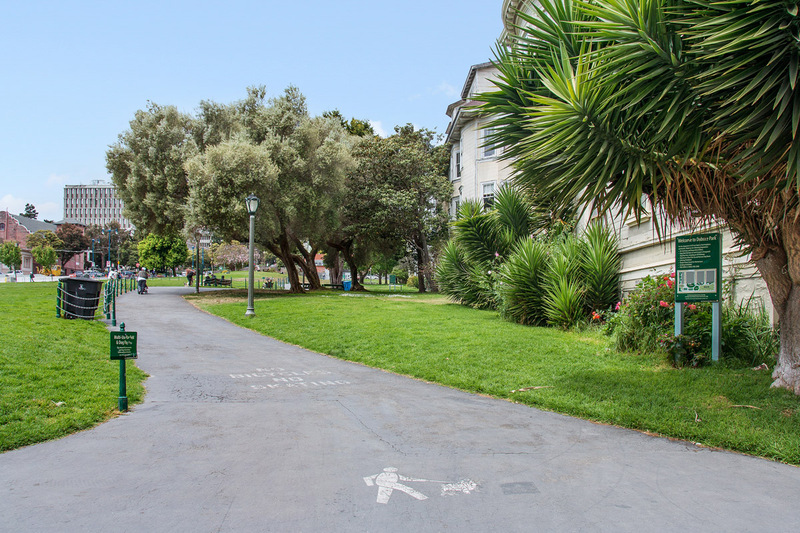 The popular bike path known as "The Wiggle" runs through the neighborhood, and packs of cyclists can be spotted streaking past the gracefully adorned Victorian and Edwardian single family homes and multi-unit buildings. 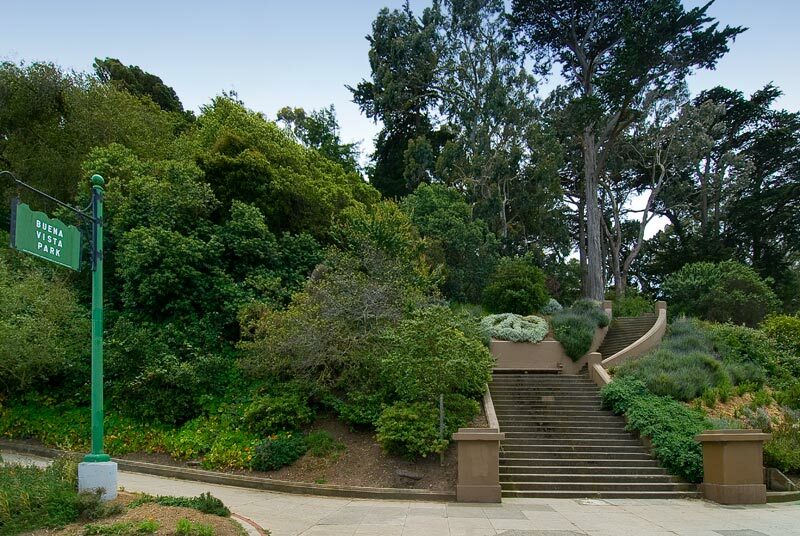 Yet despite its enviable surroundings, 99 Carmelita remains a peaceful oasis within the urban landscape. 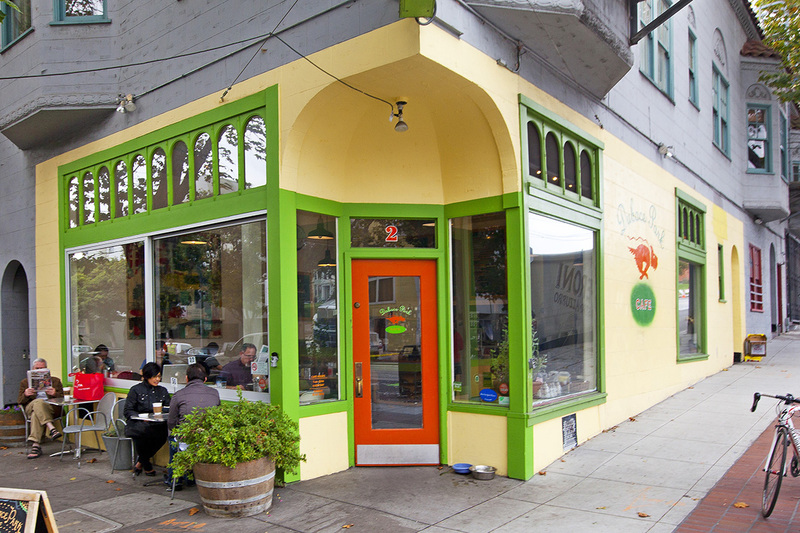 A block to the east is Cafe Révielle, the neighborhood’s newest gourmet arrival with comfortable seats and a delicious lunch menu. 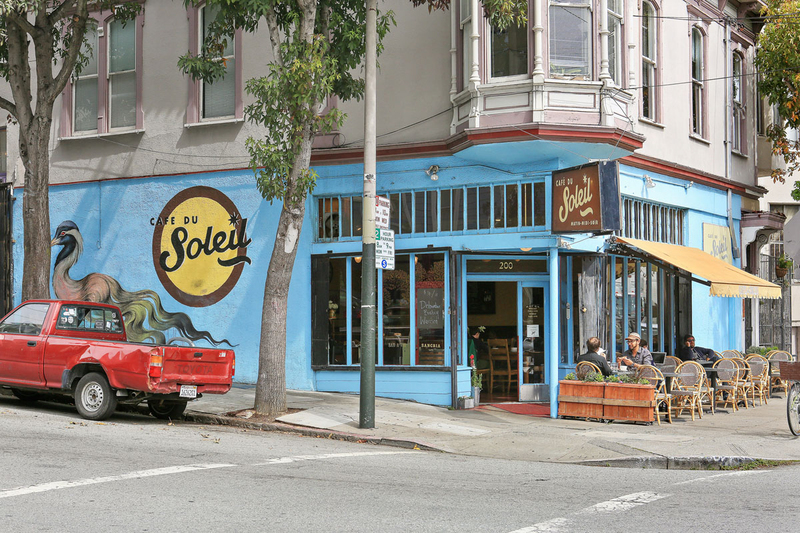 A block beyond that is Cafe du Soleil, a well-established breakfast-to-dinner bistro with charming Parisian-style outdoor tables on a sunny corner. 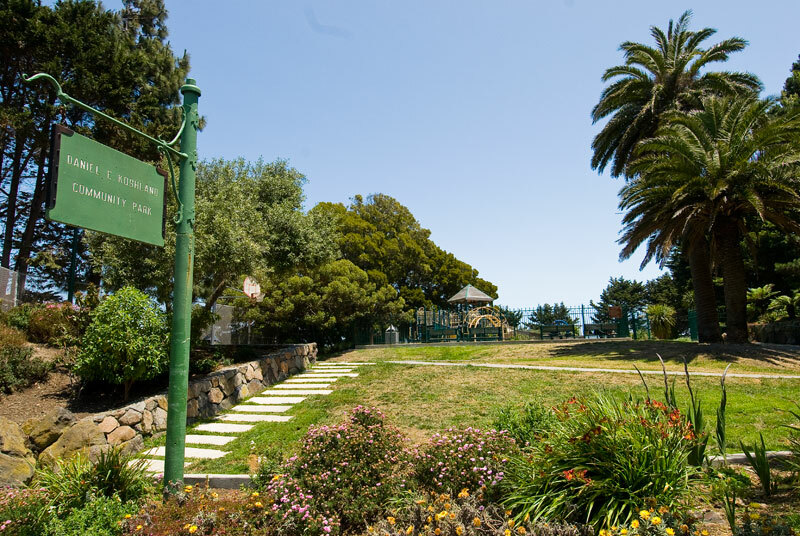 This is a relatively warm part of town, as Twin Peaks and Buena Vista Heights block much of the fog, and locals linger outside, showing off their furry friends or sharing neighborhood news. 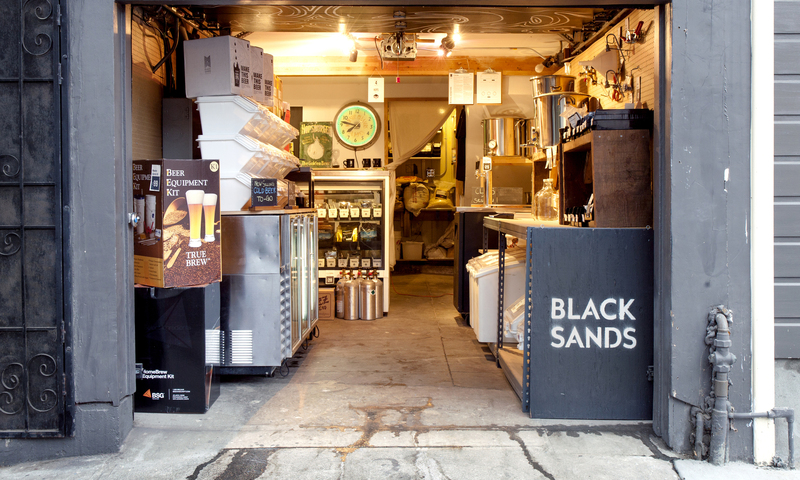 A block to the north is Black Sands, a vibrant gathering spot and contemporary gastropub / brewery that is also the first of many excellent restaurants, funky shops, and fun bars along lower Haight Street. 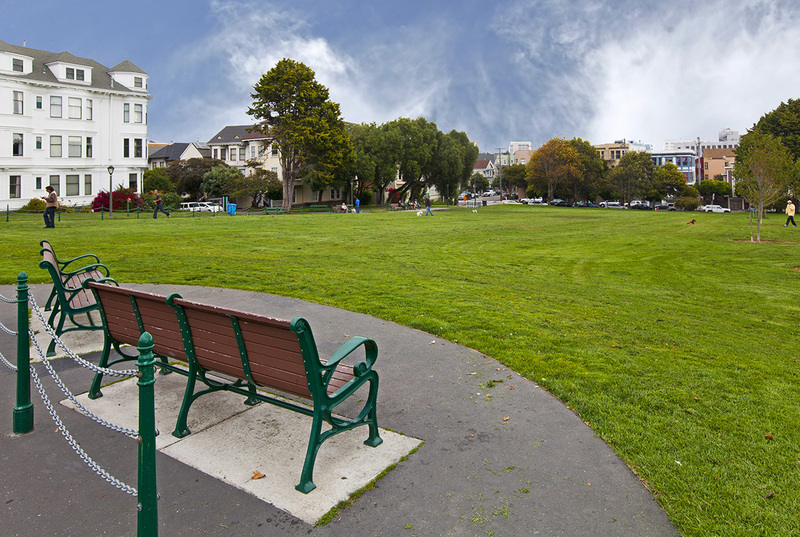 To the northwest is Buena Vista Park, the Divisadero Corridor and NOPA. 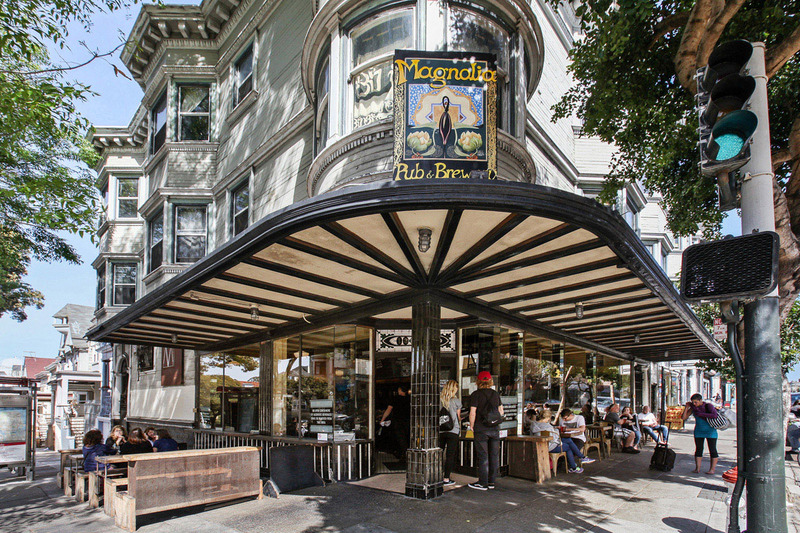 Neighborhood bars The Page and Horsefeather sit alongside restaurants like Ragazza, Bar Crudo, Little Chihuahua, Souvla, and 4505 Burgers & BBQ. 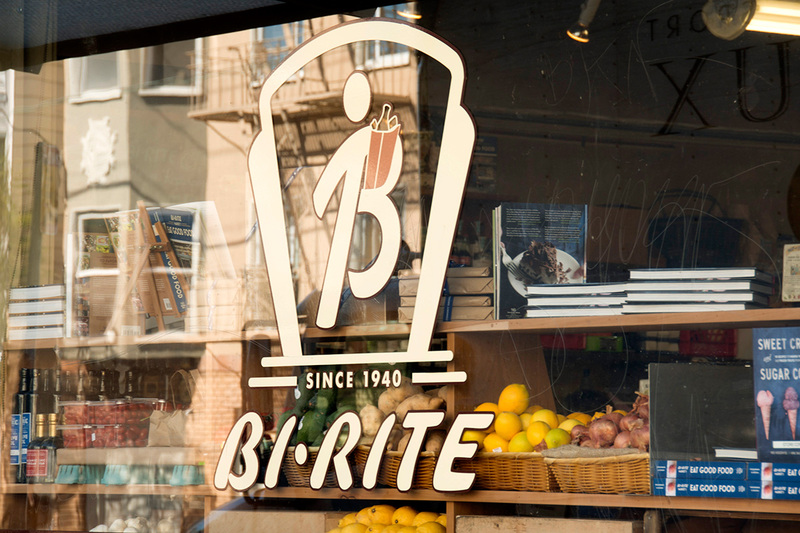 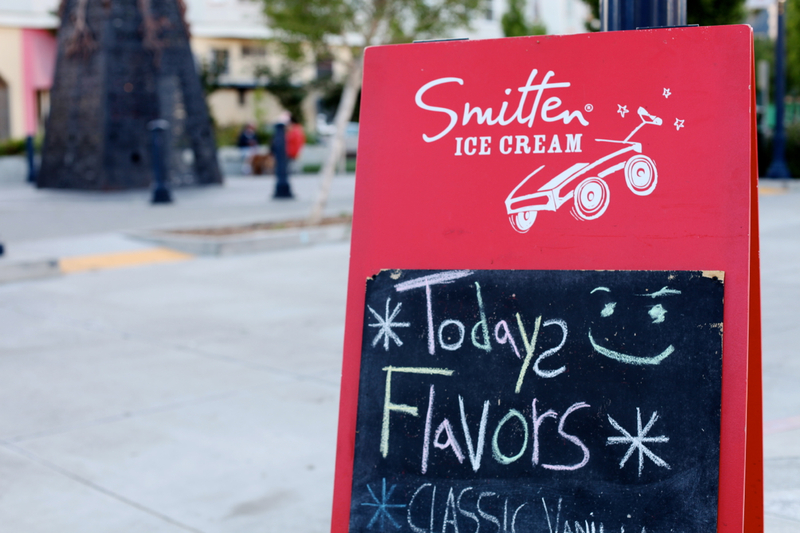 The short stroll (or bike ride) through the Wiggle to this area also brings you to Bi-Rite, a great local Sunday farmers market, and The Mill’s excellent bread and coffee. 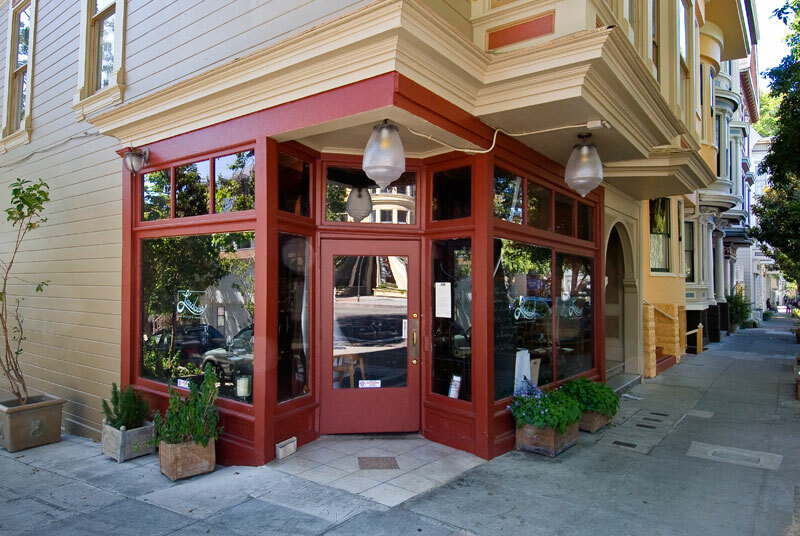 Date night might start with dinner at James-Beard-award-winning Nopalito, world-class music at The Independent, dessert and a nightcap at bustling Nopa, a leisurely walk past Alamo Square’s Painted Ladies and back home. 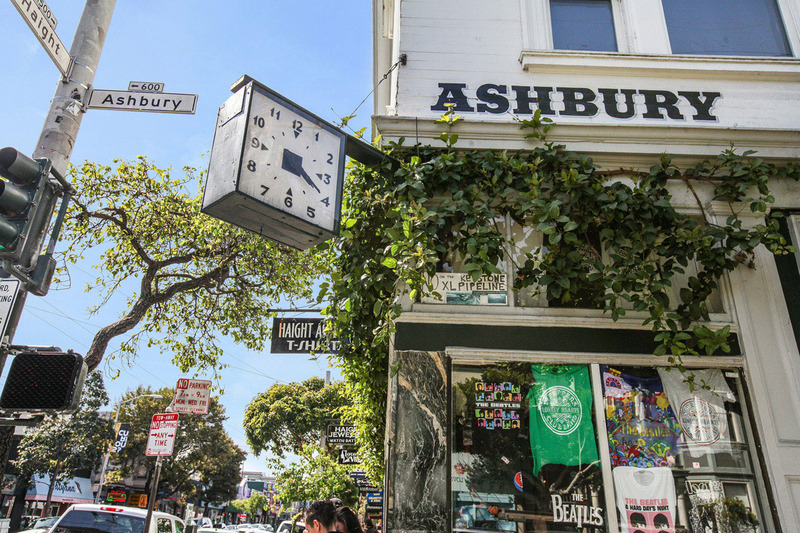 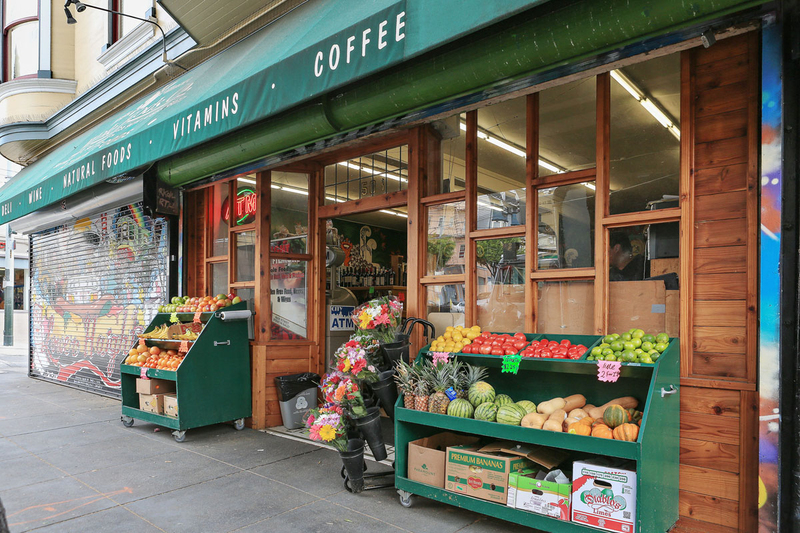 To the south, across Duboce Park and past the verdant tree-lined streets of Duboce Triangle, lies the Castro and its Market Street corridor, where you will find numerous MUNI connections and countless eateries, bars, and boutiques as well as Whole Foods and other grocery stores. 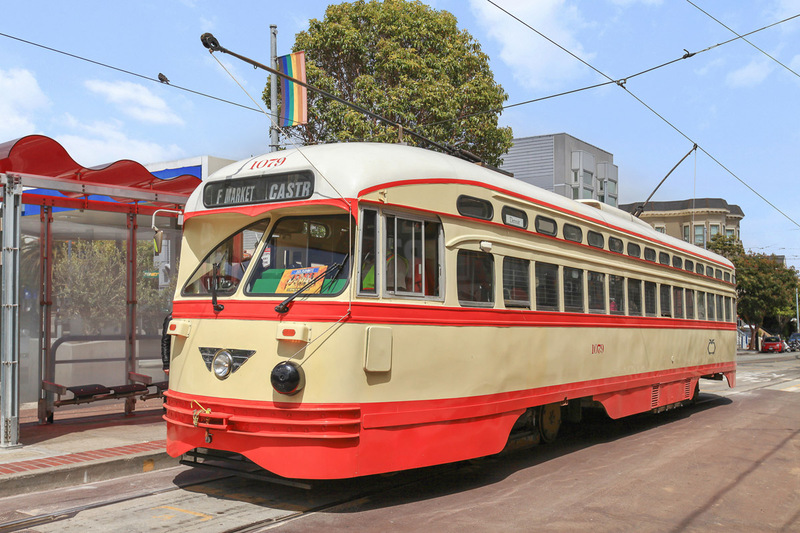 The nearby historic F line streetcars rattle past quite frequently, taking more easy-going commuters and tourists between downtown and the Castro. 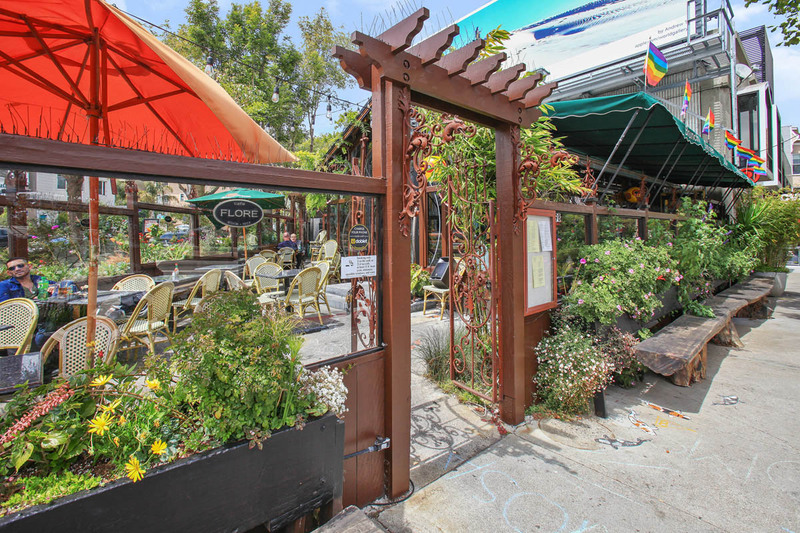 Observe all the action from the deck of the Lookout or take in a relaxed brunch on the sunny, landscaped veranda of Cafe Flor. 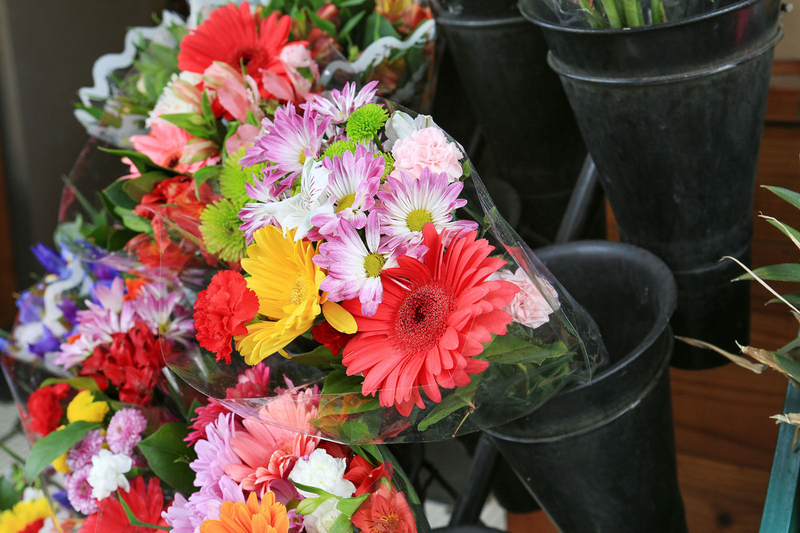 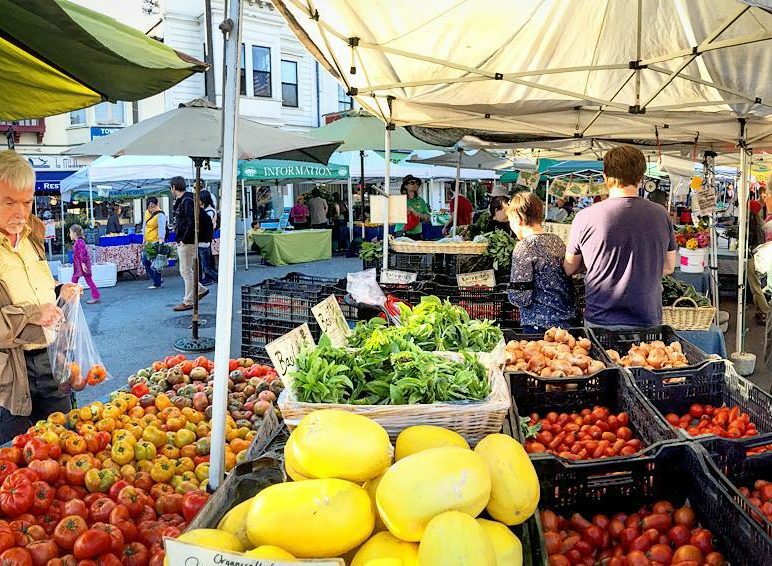 Stock up for dinner with fresh, locally grown produce at the farmers market on Noe @ Market. 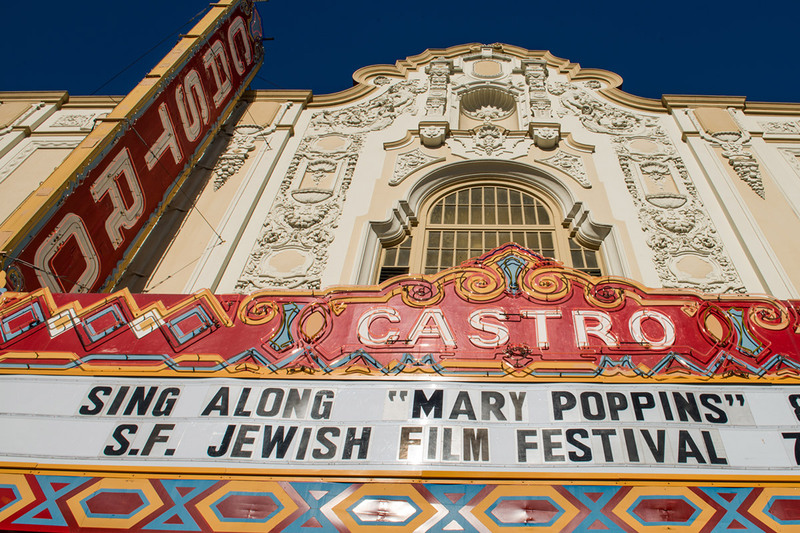 By night, the legendary Castro Theatre offers classic and art-house films in a spectacular setting. 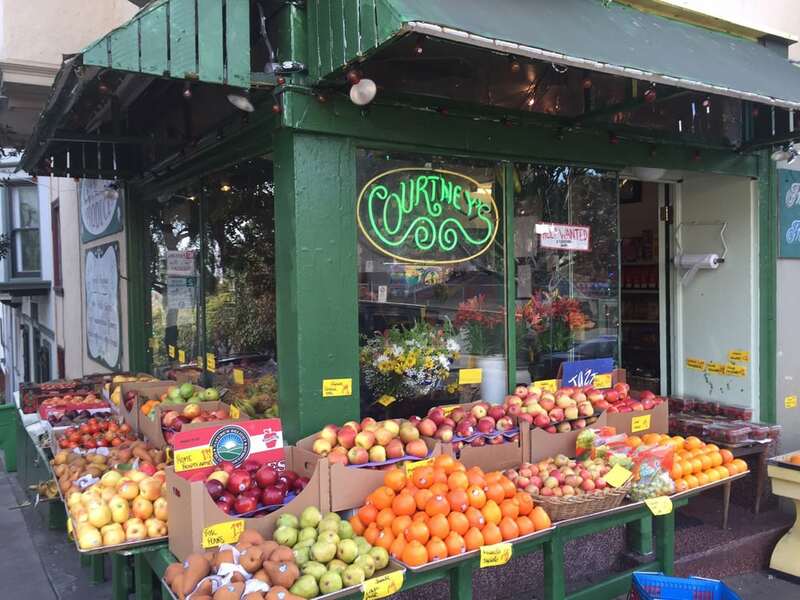 Cole Valley's lovely main street is also a very short one-stop ride away (the N-Judah MUNI enters the Sunset Tunnel right at the Duboce Park stop), with continuing service to UCSF Parnassus and Golden Gate Park. 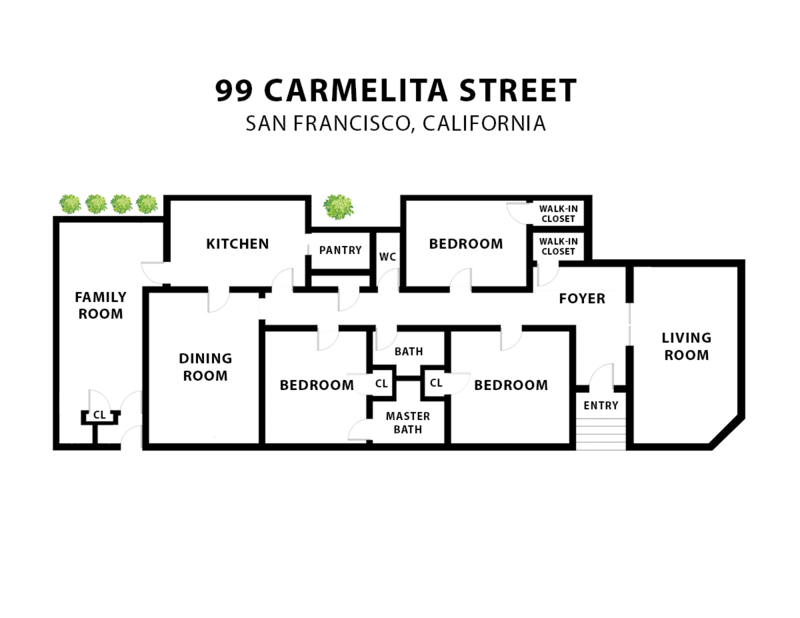 99 Carmelita is conveniently located no matter where you're headed. 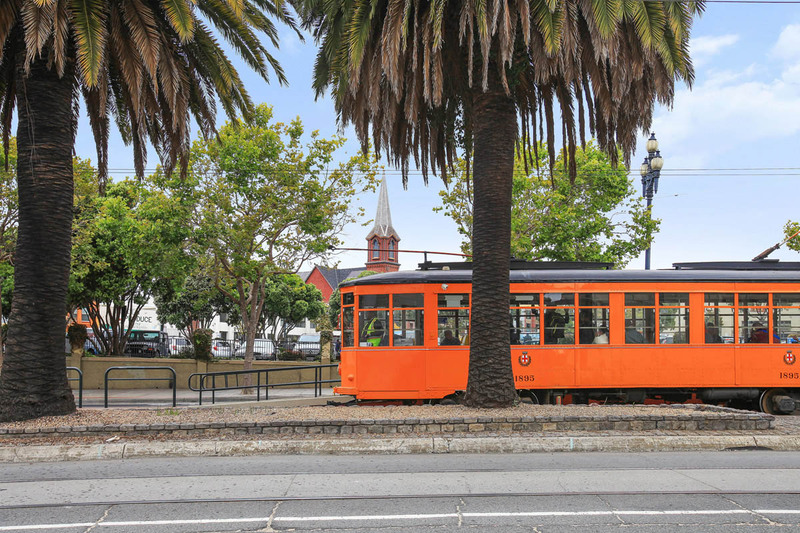 Downtown / Financial District is an easy commute, whether you drive, take a car, ride MUNI, bicycle, or walk. 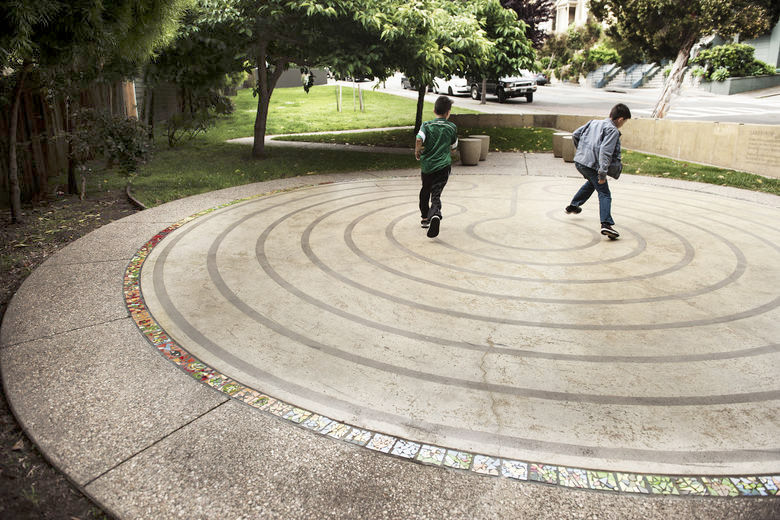 If you drive to the Peninsula or the East Bay, you'll appreciate the nearby Octavia Street onramp. 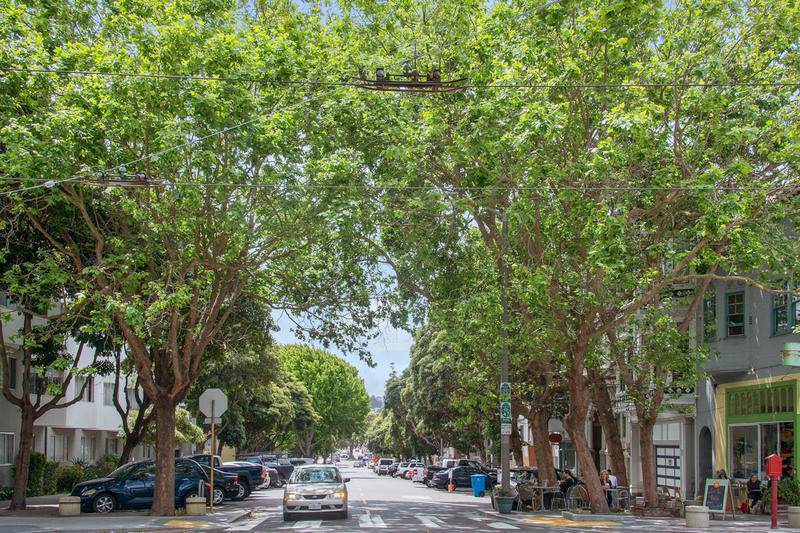 It’s all a breeze, with flat streets, light traffic and virtually no hills to navigate. 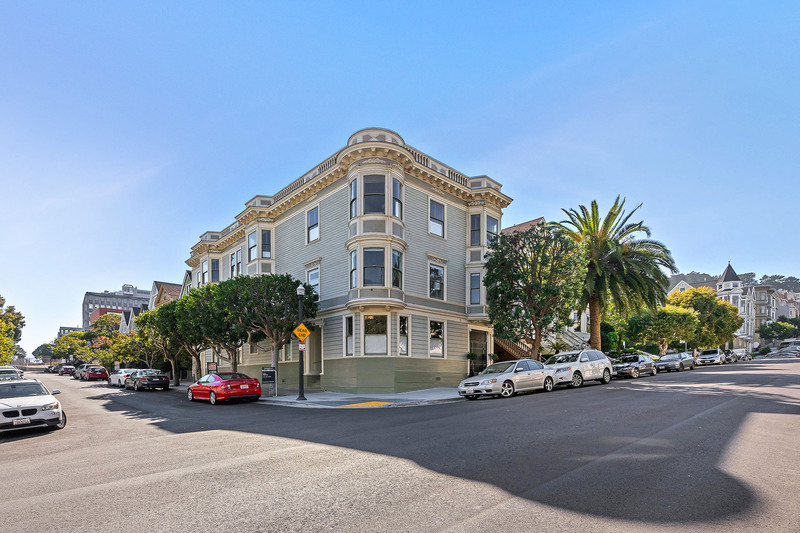 Access to the northern side of the city, including Crissy Field, the Marina, North Beach and Pacific Heights, is only a 15-minute drive. 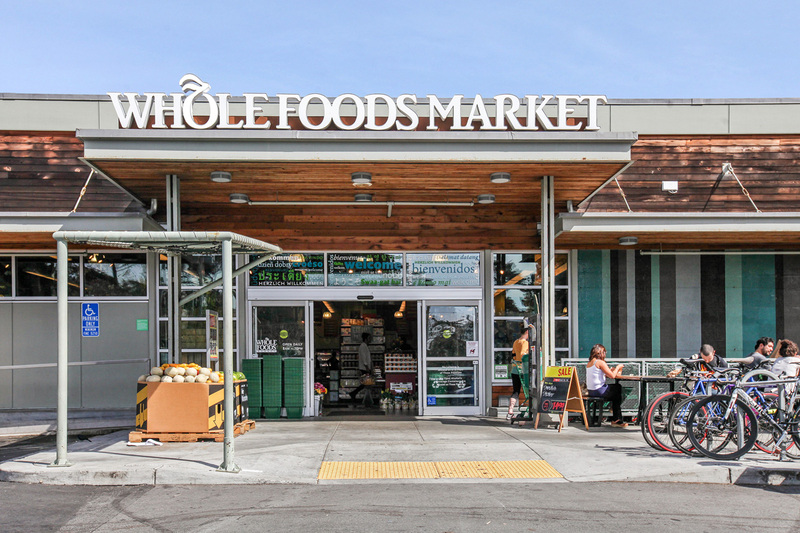 There are tech shuttles and electric bike share stations nearby. 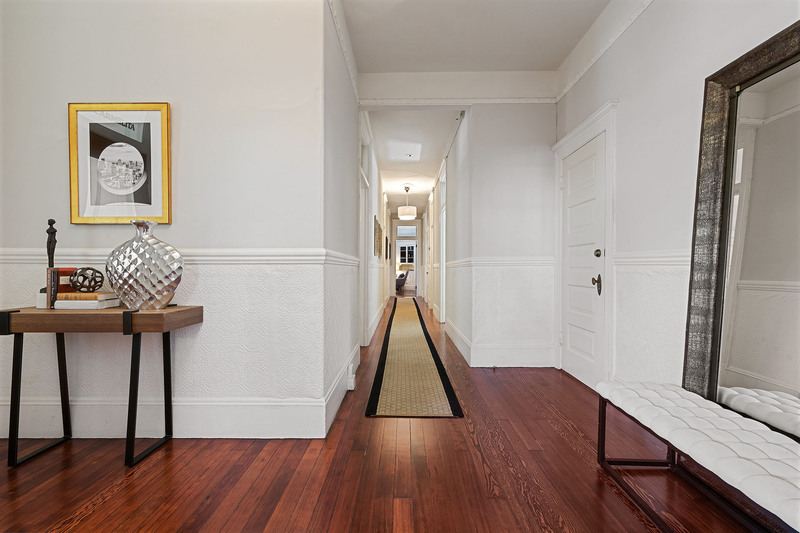 With a Walk Score of 95 and a Transit Score of 99, you couldn't wish for (or find) a more central and convenient location than this — welcome to this fantastic neighborhood and your new home!